Communication between pre- and postsynaptic cells promotes the initial organization of synaptic specializations, but subsequent synaptic stabilization requires transcriptional regulation. Here we show that fibroblast growth factor 22 (FGF22), a target-derived presynaptic organizer in the mouse hippocampus, induces the expression of insulin-like growth factor 2 (IGF2) for the stabilization of presynaptic terminals. FGF22 is released from CA3 pyramidal neurons and organizes the differentiation of excitatory nerve terminals formed onto them. 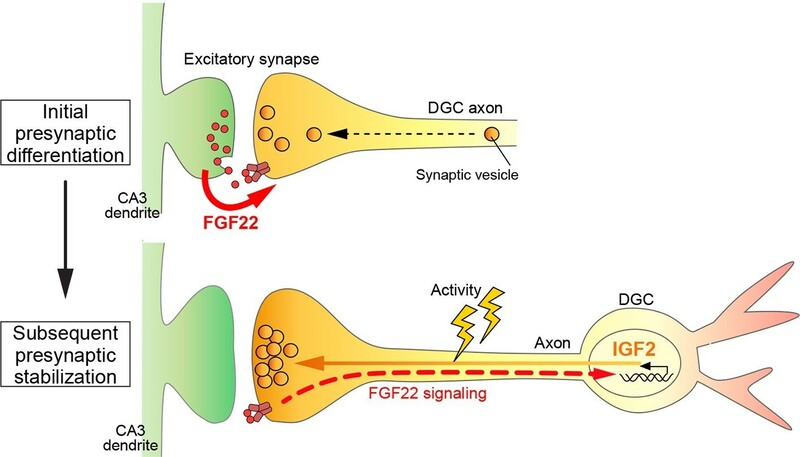 Local application of FGF22 on the axons of dentate granule cells (DGCs), which are presynaptic to CA3 pyramidal neurons, induces IGF2 in the DGCs. IGF2, in turn, localizes to DGC presynaptic terminals and stabilizes them in an activity-dependent manner. IGF2 application rescues presynaptic defects of Fgf22-/- cultures. IGF2 is dispensable for the initial presynaptic differentiation, but is required for the following presynaptic stabilization both in vitro and in vivo. These results reveal a novel feedback signal that is critical for the activity-dependent stabilization of presynaptic terminals in the mammalian hippocampus. Nerve cells in the developing brain must organize themselves into complex networks by forming appropriate connections with one another. These connections are known as synapses, and they assemble via two critical stages. First, a new synapse forms, and then it stabilizes. This first stage is a localized event that involves the contact site between the two nerve cells, while the stabilization of a synapse requires the expression of genes in a nerve cell’s nucleus. Furthermore, only active synapses may be stabilized. Many synapses form in a region of the brain called the hippocampus, which plays a key role in learning and memory. A protein called fibroblast growth factor 22 (or FGF22 for short) helps synapses to initially form within the hippocampus. However, much less is known about the signals that regulate the stabilization of synapses and the genes that are involved. It is also not clear if these genes might be controlled by FGF22 signaling. To address these questions, Terauchi et al. searched the mouse hippocampus for genes with expression that depended on FGF22 signaling. One gene in particular, which encodes a protein called insulin-like growth factor 2 (IGF2), was much less expressed in mice that lack FGF22 compared to normal mice. Further experiments revealed that only active nerve cells transport IGF2 to synapses, and that IGF2 helps to stabilize these structures. By contrast, IGF2 is not required for synapse to initially form. This indicates that FGF22 controls both the formation and stabilization of synapses, and that it controls the first stage directly, and the second stage indirectly via its effects on IGF2 expression. Terauchi et al. also showed that FGF22-IGF2 signaling is not involved in the stabilization of all synapses in the mouse hippocampus. Instead, synapses between different types of nerve cell appear to use distinct signals for synapse formation and stabilization. A key topic for future studies will be to understand these specific signals and how they cooperate in the brain to establish precise networks of nerve cells. Synapses are the sites of neuronal communication in the brain. Proper synapse formation is critical for appropriate brain function; aberrant synaptic connectivity may result in various neurological and psychiatric disorders, such as autism, Fragile X syndrome, epilepsy, and schizophrenia (Banerjee et al., 2014; Casillas-Espinosa et al., 2012; Lisman, 2012; Pfeiffer and Huber, 2009). Synapse formation begins with target recognition by axons, which is followed by synaptic differentiation at the contact sites. Synaptic differentiation is regulated by signals that are exchanged between pre- and postsynaptic sites. Various target-derived presynaptic organizers, such as fibroblast growth factors (FGFs), WNTs, neurotrophins, neuroligins, Ephs/ephrins, SynCAMs, netrin-G ligands (NGLs), and signal regulatory proteins (SIRPs) are shown to promote local differentiation of presynaptic terminals (Darabid et al., 2014; Fox and Umemori, 2006; Henriquez et al., 2011; Johnson-Venkatesh and Umemori, 2010; Regehr et al., 2009; Salinas, 2012; Shen and Scheiffele, 2010; Siddiqui and Craig, 2011; Toth et al., 2013; Zweifel et al., 2005). Initial synapses thereafter maturate, resulting in a more stable, functional, and finely tuned neural network (Goda and Davis, 2003; Waites et al., 2005; West and Greenberg, 2011). Presynaptic stabilization has been shown to require gene expression. At the Drosophila larval neuromuscular junction (NMJ), a retrograde signal initiated by glass bottom boat (Gbb), the Drosophila homologue of bone morphogenic protein (BMP), controls presynaptic growth and stabilization through transcriptional regulation in motor neurons. During this process, Gbb and its receptor are internalized and transported from the nerve terminal to the cell body as a retrograde signal. This signal then activates a transcription factor, Mothers against decapentaplegic (Mad) (Aberle et al., 2002; Marqués et al., 2002; McCabe et al., 2003). Activated Mad regulates transcription of genes including Trio and dfmr1 (fly homolog of FMR1). Trio and dFMR1 play critical roles in modulating actin cytoskeletal dynamics and stabilizing microtubules in the presynaptic motor neurons, leading to presynaptic growth and stabilization (Ball et al., 2010; Nahm et al., 2013). In the mammalian brain, changes in gene expression, as a consequence of axon–dendrite contacts, are also likely to contribute to presynaptic stabilization. For example, expression of genes encoding vesicle proteins increases soon after synaptogenesis begins, and neurons synthesize different isoforms of vesicle proteins before and after their axons contact targets (Campagna et al., 1997; Lou and Bixby, 1995; Plunkett et al., 1998; Sanes and Lichtman, 1999). In addition, synaptic stabilization is influenced by neural activity (Ackermann et al., 2015; Chia et al., 2013; Dalva et al., 2007; Lichtman and Colman, 2000; Ruthazer and Cline, 2004; Waites et al., 2005). However, it is not known whether and how target-derived molecules control gene transcription in the presynaptic neurons for the stabilization of presynaptic terminals, and whether such a pathway is regulated by neural activity. We have previously found that FGF22 serves as a target-derived presynaptic organizer in the mouse hippocampus, a key brain region associated with learning, memory, emotional processing, and social behavior. FGF22 is released from CA3 pyramidal neurons and promotes local differentiation of the excitatory presynaptic terminals formed onto them (Terauchi et al., 2010; 2015). FGF22-dependent presynaptic differentiation requires two FGF receptors (FGFRs), FGFR2b and FGFR1b, in dentate granule cells (DGCs), the major presynaptic neurons for CA3 pyramidal neurons, and the downstream signaling molecules FGFR substrate 2 (FRS2) and PI-3 kinase (Dabrowski et al., 2015). Signals mediated by FRS2 and PI-3 kinase are known to regulate gene expression. Therefore, we hypothesized that FGF22 signaling eventually regulates gene expression and that those FGF22-induced molecules, in turn, contribute to the stabilization of presynaptic terminals. Here, we identified FGF22 target genes in the presynaptic DGCs and asked whether the target genes contribute to presynaptic stabilization. We find that i) target-derived FGF22 signaling induces the expression of the insulin-like growth factor 2 (Igf2) gene in DGCs, ii) IGF2 then localizes to presynaptic terminals of DGCs and stabilizes them, iii) the transportation of IGF2 to the presynaptic terminal is activity-dependent, and iv) IGF2 is not required for the initial presynaptic differentiation, but is required for subsequent presynaptic stabilization both in vitro and in vivo. Thus, FGF22 is a target-derived molecule not only organizing local, initial presynaptic differentiation, but also regulating IGF2 expression in the presynaptic neurons. IGF2, in turn, contributes to presynaptic stabilization in an activity-dependent manner. Our results reveal a novel feedback signal that is critical for the activity-dependent stabilization of presynaptic terminals in the mammalian brain. FGF signals are involved in the development of many organs via regulation of gene expression (Chen et al., 2012; Mazzoni et al., 2013). We hypothesized that in the hippocampus, the excitatory presynaptic organizer FGF22 would activate gene expression in the presynaptic neurons for the stabilization of presynaptic terminals. We focused on genes expressed in DGCs, because they provide a major excitatory input to CA3 pyramidal neurons, and their presynaptic differentiation is dependent on FGF22–FGFR signaling (Dabrowski et al., 2015). In the hippocampus, synapse formation starts in the first postnatal week and finishes by postnatal day 28 (P28) (Danglot et al., 2006; Steward and Falk, 1991). Presynaptic defects in Fgf22-/- mice begin to appear as early as P8 and are evident at P14 (Terauchi et al., 2010). To identify FGF22-regulated genes, we dissected P14 DGCs and compared gene expression profiles between wild-type (WT) and Fgf22-/- mice. Microarray analysis revealed several genes that are downregulated in Fgf22-/- DGCs relative to controls (Table 1). One of the most significantly downregulated genes was Igf2. This down-regulation was confirmed by RT-PCR (Figure 1—figure supplement 1), qPCR (Igf2 was decreased to 53.1 ± 12.2% in Fgf22-/- mice relative to WT mice), and in situ hybridization. In situ hybridization experiments showed that at P14, and not at P7, expression of Igf2 mRNA was decreased in DGCs (Figure 1A–D). It was not decreased in other hippocampal cells such as CA1 and CA3 pyramidal neurons of Fgf22-/- mice (Figure 1A–D). Interestingly, Igf2 expression was clearly decreased in the inner layer of Fgf22-/- DGCs, where relatively immature DGCs are located (Figure 1C and D) (Aguilar-Arredondo et al., 2015). List of genes that are significantly downregulated in DGCs of Fgf22-/- mice at P14. Genes with Diff Score < -33 (p-value <0.001) relative to WT are shown in the table. IGF2 expression is decreased in young DGCs in Fgf22-/- mice during the stage of synapse stabilization. (A–D) In situ hybridization for Igf2 mRNA. (A) At P7 (initial stage of synaptic differentiation), Igf2 mRNA is similarly expressed in the hippocampus of WT and Fgf22-/- mice. Higher magnification views of the boxed areas are shown in (B). (C) At P14 (around the time of synaptic stabilization), Igf2 mRNA is decreased in Fgf22-/- mice in the inner molecular layer of DGCs. Higher magnification views of the boxed areas are shown in (D). Observations are from 3–5 animals per age and strain. (E–H) P7 and P14 hippocampal sections from WT and Fgf22-/- mice were immunostained for IGF2 and for either calretinin (CR; young DGCs) or calbindin (CB; mature DGCs). The illustration shows the pictured area (boxed). (E) IGF2 expression in DGCs at P7. Quantification of IGF2 immunoreactivity in CR and CB layers is shown in (F). There is no significant difference in the IGF2 intensity in either layer of DGCs at P7. (G) IGF2 expression in DGCs at P14. Quantification of IGF2 intensity in CR and CB layers is shown in (H). In P14 Fgf22-/- mice, IGF2 is significantly decreased in the CR-positive layer, but not in CB-positive layer of DGCs. Error bars are s.e.m. Data are from 77–160 fields from 3–5 animals. Significant difference from control at ***p<0.0001 by Student's t-test. Scale bars, (A and C) 500 μm, (B and D) 50 μm, (E and G) 20 μm. We then asked whether IGF2 expression was decreased in a specific developmental stage of DGCs in Fgf22-/- mice. Using specific markers, DGCs can be classified into several developmental subsets: from newborn to mature, DGCs are positive for Ki67 (dividing DGCs), doublecortin (immature), calretinin (young), and calbindin (mature) (Abrous et al., 2005). Ki67-, doublecortin-, and calretinin-positive DGCs populate the inner granule cell layer, and calbindin-positive DGCs the outer. We found that IGF2 protein expression was decreased in calretinin-positive, but not in calbindin-positive DGCs in Fgf22-/- mice relative to WT mice at P14 (Figure 1G and H; the specificity of the anti-IGF2 antibody was verified using tissues from Igf2-/- mice: Figure 1—figure supplement 2). Consistent with the in situ results, no changes were observed at P7 (Figure 1E and F). These results indicate that the lack of FGF22 impairs IGF2 expression in young, developing DGCs during the stage of synapse stabilization. FGF22 is highly expressed by CA3 pyramidal neurons in the hippocampus (Terauchi et al., 2010). We next examined whether FGF22 derived from CA3 pyramidal neurons is responsible for IGF2 expression in DGCs. For this, we inactivated FGF22 preferentially in CA3 pyramidal neurons using Fgf22flox/flox mice (Fgf22f/f; EUCOMM) crossed with Grik4-Cre mice (Figure 2A). Grik4-Cre mice express Cre in 100% of CA3 pyramidal neurons and 10% of DGCs in the hippocampus (Nakazawa et al., 2002). We found that at P14, IGF2 expression in the inner layer, but not in the outer layer, of DGCs of Fgf22f/f::Grik4-Cre mice was significantly decreased relative to that of control littermates (controls include wild type and Fgf22f/f mice; we did not observe any significant differences in IGF2 staining between wild type and Fgf22f/f mice) (Figure 2B–D). The level of decrease in IGF2 expression in the inner layer of Fgf22f/f::Grik4-Cre mice was similar to that in Fgf22-/- mice. These results suggest that CA3-derived FGF22 regulates the expression of IGF2 in young DGCs in vivo. IGF2 expression in young DGCs is decreased in CA3-selective Fgf22-knockout mice. (A) Schematic of CA3-selective Fgf22 deletion: Fgf22flox/flox(Fgf22f/f) mice were crossed with mice carrying Grik4-promoter-driven Cre (Grik4-Cre). (B–D) IGF2 staining in the DGCs of P14 Fgf22f/f::Grik4-Cre mice and control littermates (WT and Fgf22f/f mice; we did not observe any significant differences in IGF2 staining between WT and Fgf22f/f mice). (B) Illustration showing the pictured area (boxed). (C) Representative pictures of IGF2 immunostaining in DGCs. The dashed line indicates the border between the inner and outer layers of DGCs. (D) Quantification of IGF2 immunoreactivity in the inner and outer DGC layers. CA3-selective inactivation of FGF22 results in a significant decrease in the IGF2 expression in the inner DGC layer, but not in the outer DGC layer. Error bars are s.e.m. Data are from 20–25 fields (D, inner DGC layer) and from 40–50 fields (D, outer DGC layer) from 4–5 animals. Significant difference from control at ***p<0.0001 by Student's t-test. Scale bar, 20 μm. We next examined whether IGF2 expression in DGCs is increased by FGF22 treatment in culture. DGCs were identified with a marker, Prox1 (Iwano et al., 2012). In our hippocampal culture, initial formation of glutamatergic synapses starts from ~3 days in vitro (3DIV), followed by activity-dependent synapse maturation from ~8DIV to ~12DIV (Terauchi et al., 2010; Toth et al., 2013). When cultured hippocampal cells were treated with FGF22 at 1DIV, IGF2 expression in the soma of DGCs was significantly increased at 7DIV (Figure 3A and B). We next asked whether only specific developmental subsets of DGCs increase IGF2 expression in response to FGF22 treatment. We found that FGF22-dependent increase in IGF2 was observed in calretinin-positive DGCs, but not in calbindin-positive DGCs (Figure 3C and E). In contrast, IGF2 expression did not increase in non-DGCs, such as CA3 pyramidal neurons, which were identified by immunostaining with Py-antibody (Figure 3D and E). These results demonstrate that FGF22 signaling regulates IGF2 expression in young, calretinin-positive DGCs. Note that at 7DIV, a majority of DGCs in culture were calretinin-positive (63.65 ± 1.40%; Figure 3—figure supplement 1), indicating that our results with DGCs (identified as Prox1-positive cells) mostly reflect calretinin-positive DGCs. Bath and axonal application of FGF22 increases IGF2 expression in young DGCs. (A–E) Cultured hippocampal neurons were treated with FGF22 at 1DIV, and fixed and stained at 7DIV. (A) Bath application of FGF22 increases IGF2 expression in DGCs (Prox1-positive). (B) Quantification of IGF2 immunoreactivity in the cell bodies of DGCs, normalized to untreated condition. (C) Bath application of FGF22 increases IGF2 expression in CR-positive DGCs, but not in CB-positive DGCs. (D) Bath application of FGF22 does not affect IGF2 expression in CA3 pyramidal neurons (Py-positive). (E) Quantification of IGF2 immunoreactivity in the cell bodies of CR- or CB-positive DGCs and CA3 pyramidal neurons. Data are normalized to the intensity from untreated cells. (F–I) Hippocampal neurons were plated onto the somal compartment of microfluidic chambers and cultured. FGF22 was applied into the axonal compartment at 2DIV, and cells were fixed and stained at 8DIV. (F) Schematic illustration of the microfluidic chamber. Representative pictures in (G) and (H) are taken from the boxed areas. (G–I) Axonal treatment of FGF22 increases IGF2 in the cell body of DGCs. (G) Lower magnification views of Prox1 positive DGCs. (H) Higher magnification views from the boxed areas in (G). Quantification of IGF2 immunoreactivity in the cell bodies of DGCs is shown in (I). Error bars are s.e.m. Data are from (B) 292–260 cells from 3 independent experiments, (E) 25–45 cells from 4 to 5 independent experiments, and (I) 67–78 cells from 3–4 independent experiments. Significant difference from control at ***p<0.0001 by Student's t-test. Scale bars, (A, C, D and H) 10 μm, (F) 100 μm, (G) 50 μm. FGF22 is a target-derived presynaptic organizer that acts on axons. Hence, we next investigated whether local treatment with FGF22 at DGC axons is sufficient to increase expression of IGF2 in DGCs. Cultured hippocampal neurons were divided into axonal and somal compartments using an in vitro microfluidic culture system (Figure 3F). Axons of cultured hippocampal cells appeared in the axonal compartment by 2DIV. Local application of FGF22 at 2DIV to the axonal compartment resulted in an increase in IGF2 level in the cell bodies of Prox1-positive DGCs at 8DIV (Figure 3G–I), indicating that retrograde FGF22 signaling from axon terminals increases IGF2 expression in the soma of DGCs. Application of FGF22 increases IGF2 expression in the DGC soma. We next asked where the induced IGF2 localizes in the DGCs. To address this question, we transfected EGFP-tagged IGF2 (IGF2-EGFP) and analyzed its localization in cultured DGCs. IGF2-EGFP showed a punctate pattern in neurofilament-positive axons of DGCs, while it was dim and diffuse throughout MAP2-positive dendrites of these neurons (Figure 4A). IGF2-EGFP puncta in the axons of cultured DGCs were colocalized with cotransfected synaptophysin-mCherry (83.1 ± 1.0% of IGF2-EGFP puncta were colocalized with synaptophysin-mCherry; Figure 4B), indicating that IGF2 localizes to presynaptic terminals. We then asked whether IGF2, which is a secreted protein, is localized on the surface of presynaptic terminals. We stained IGF2-EGFP transfected neurons with the anti-GFP antibody without a detergent followed by Alexa Fluor 647 secondary antibody (Figure 4C). We found that 41.2 ± 0.9% of IGF2-EGFP was localized on the cell surface. 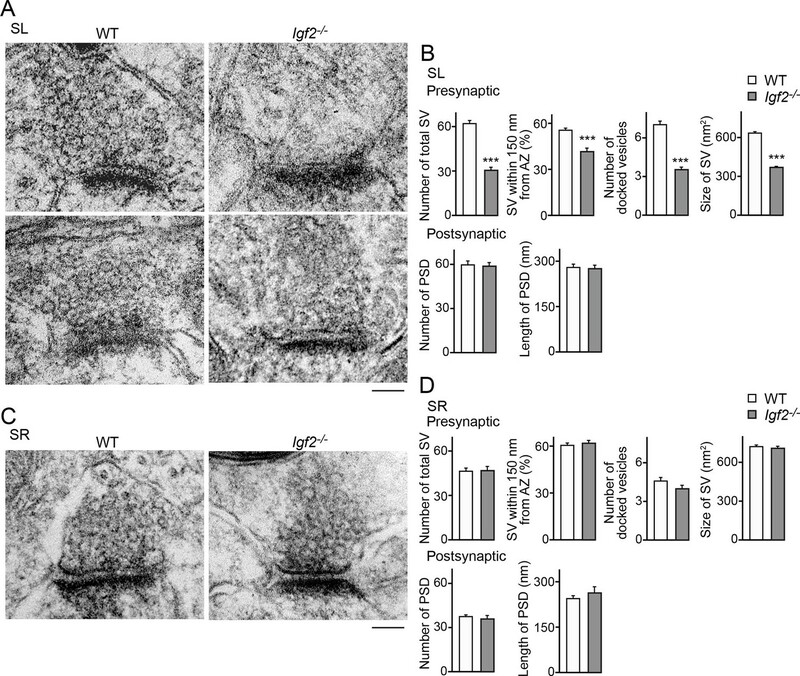 Surface IGF2-EGFP was always colocalized with synaptophysin-mCherry (Figure 4C), suggesting that IGF2 is secreted and tethered on the surface of presynaptic terminals. Next, we examined the localization of IGF2 receptors. IGF2R, the major receptor for IGF2 (Fernandez and Torres-Aleman, 2012), showed a punctate pattern in the axons of DGCs (Figure 4—figure supplement 1A) and was localized at presynaptic terminals (84.32 ± 0.90% of IGF2R puncta were colocalized with VGLUT1 puncta; Figure 4—figure supplement 1B). These results are consistent with the notion that IGF2 is secreted from the presynaptic terminal and binds to IGF2R, which is also localized at the presynaptic terminal. IGF2 localizes to presynaptic terminals of DGCs. Cultured hippocampal neurons were transfected with the IGF2-EGFP plasmid at 3DIV, and fixed and stained at 10DIV. (A) IGF2-EGFP showed a punctate pattern of localization in neurofilament positive axons, while a diffuse pattern in MAP2 positive dendrites of DGCs. Observations were from at least 10 transfected Prox1 positive DGCs from 2 independent experiments. (B) The IGF2-EGFP plasmid was co-transfected with synaptophysin-mCherry (Sphy-mCherry) plasmid. Most of IGF2-EGFP puncta (83.1 ± 1.0% of total IGF2-EGFP puncta; data are from 53 cells from 3 independent experiments) co-localizes with synaptophysin-mCherry, a presynaptic terminal marker. (C) ~40% of IGF2-EGFP is localized on the surface of presynaptic terminals. At 10DIV, cells were stained with the anti-GFP antibody without a detergent, followed by Alexa Fluor 647 (shown in blue in the images). Surface IGF2-EGFP is always colocalized with synaptophysin-mCherry. Data are from 15 cells from 3 independent experiments. Scale bars, 10 μm. We next determined whether IGF2 expressed in DGCs promotes presynaptic development. To detect presynaptic development, we cotransfected IGF2 with synaptophysin-YFP. Overexpression of IGF2 increased the density and the size of synaptophysin-YFP puncta in DGCs compared to those in control cultures (Figure 5A), without apparently altering the morphology of DGCs (Figure 5—figure supplement 1). No effect of IGF2 overexpression was found in synaptophysin-YFP puncta in Prox1-negative non-DGCs (Figure 5B). These results indicate that IGF2 promotes presynaptic development specifically in DGCs. Overexpression of IGF2 in DGCs promotes their presynaptic development. Cultured hippocampal neurons were transfected with the plasmid expressing IGF2 together with the synaptophysin-YFP plasmid at 3DIV, and fixed and stained at 10DIV. (A) Clustering of synaptophysin-YFP is increased in IGF2-overexpressed DGCs (Prox1-positive) compared to control DGCs. The graphs show quantification of the number and size of synaptophysin-YFP puncta in control and IGF2-overexpressed DGCs. (B) Overexpression of IGF2 does not alter clustering of synaptophysin-YFP in Prox1-negative hippocampal neurons. The graph shows quantification of the number and size of synaptophysin-YFP puncta in Prox1 negative neurons with or without IGF2 overexpression. Error bars are s.e.m. Data are from (A) 36–44 cells from 5–7 independent experiments, (B) 11–13 cells from 2–3 independent experiments. Significant difference from control at ***p<0.0001 by Student's t-test. Scale bars, 10 μm. Synapse formation can be separated into two stages: the initial synaptic differentiation stage and the synapse maturation stage. Initial synaptic differentiation is usually regarded as an activity-independent step, while synaptic maturation, including synaptic growth, elimination, and stabilization, is influenced by neural activity. Our previous report identified that activity-dependent refinement of DGC–CA3 connections begins at ~P15 (Yasuda et al., 2011), which is around when we observed decreased IGF2 expression in Fgf22-/- mice (Figure 1). Thus, we next asked whether IGF2 expression, IGF2 localization, and/or IGF2 function for synaptogenesis require neural activity. With FGF22 treatment, IGF2 expression increased in the soma of cultured DGCs (Figure 3A, Figure 6A and B). Blockade of neural activity with tetrodotoxin (TTX) did not disturb the ability of FGF22 to increase IGF2 expression (Figure 6A and B). We then examined the effect of TTX on presynaptic localization of IGF2. We found that TTX treatment reduced the clustering and synaptic localization of IGF2 (Figure 4, Figure 6C and D). Finally, we assessed the requirement of neural activity in IGF2 function to induce presynaptic development. IGF2 overexpression increased synaptophysin-YFP accumulation in cultured DGCs (Figure 5A, Figure 6E and F). This increase was completely blocked by TTX treatment (Figure 6E and F). These results indicate that neural activity is not required for FGF22 to induce IGF2 expression, but is necessary for IGF2 to localize to and organize development of presynaptic terminals. To confirm that the activity of presynaptic neurons is critical for the localization and function of IGF2, we suppressed intrinsic neuronal excitability of DGCs by sparsely transfecting the inwardly rectifying potassium channel, Kir2.1, in culture (Johnson-Venkatesh et al, 2015). Similarly to the results with TTX, Kir2.1 expression in DGCs decreased the synaptic localization of IGF2 (Figure 6G and H) and completely blocked the synaptogenic function of IGF2 (Figure 6I and J). These results indicate that intrinsic neuronal excitability of DGCs is required for the presynaptic localization of IGF2 and its synaptogenic function. Neural activity is necessary for synaptic localization and synaptogenic effects of IGF2, but not for FGF22-dependent IGF2 expression. (A and B) Cultured hippocampal neurons were treated with FGF22 at 1DIV, and fixed and stained at 7DIV, as in Figure 3A. At 1DIV and 5DIV, TTX was added in the media to block neuronal activity. Bath application of FGF22 increases IGF2 expression in DGCs without (left panels) as well as with activity blockade (right panels). Quantification of IGF2 immunoreactivity in the cell bodies of DGCs is shown in (B). (C–F) TTX treatment impairs synaptic localization of IGF2 and its synaptogenic function. (C and D) Cultured hippocampal neurons were transfected with the IGF2-EGFP plasmid together with synaptophysin-mCherry (Sphy-mCherry) plasmid at 3DIV, and fixed and stained at 10DIV, as in Figure 4B. At 3DIV and 7DIV, TTX was added in the media to block global neuronal activity. Quantification of the number and size of IGF2-EGFP puncta, and percentage of IGF2-EGFP puncta that colocalized with synaptophysin-mCherry puncta are shown in (D). TTX treatment decreases IGF2-EGFP clustering and synaptic localization. (E and F) Cultured hippocampal neurons were transfected with the plasmid expressing IGF2 together with the synaptophysin-YFP plasmid at 3DIV, and fixed and stained at 10DIV, as in Figure 5. TTX was added in the media at 3DIV and 7DIV. IGF2 overexpression increases clustering of synaptophysin-YFP in Prox1-positive DGCs without TTX (upper panels), but not with TTX (lower panels). (F) Quantification of the number and size of synaptophysin-YFP in DGCs with or without IGF2 overexpression in the presence or absence of TTX. (G–J) Suppression of intrinsic neuronal excitability impairs synaptic localization of IGF2 and its synaptogenic function. (G and H) Cultured hippocampal neurons were transfected with the plasmids expressing Kir2.1, IGF2-EGFP, and synaptophysin-mCherry (Sphy-mCherry) at 3DIV. Cells were fixed and stained at 10DIV. Percentage of IGF2-EGFP puncta that colocalized with synaptophysin-mCherry puncta in Prox1-positive DGCs is shown in (H). Kir2.1 expression decreases synaptic localization of IGF2-EGFP in DGCs. (I and J) Cultured hippocampal neurons were transfected with the plasmids expressing Kir2.1, IGF2, and synaptophysin-YFP at 3DIV. Cells were fixed and stained at 10DIV. (J) Quantification of the number and size of synaptophysin-YFP in DGCs with or without IGF2 overexpression in the presence or absence of Kir2.1. IGF2 overexpression increases clustering of synaptophysin-YFP in Prox1-positive DGCs, but the increase is suppressed by Kir2.1 expression. Error bars are s.e.m. Data are from (B) 35–292 cells from 3 independent experiments, (D) 20–32 cells from 3–4 independent experiments, (F) 22–24 cells from 3 independent experiments, (H) 7 cells from 3 independent experiments, (J) 20 cells from 4 independent experiments. Significant difference from control at ***p<0.0001 by two-way ANOVA followed by Tukey's multiple comparison test (B, F, and J) and by Student's t-test (D and H). n.s. : no statistical significant difference. Scale bars, 10 μm. We next asked whether IGF2 acts downstream of FGF22 signaling in the regulation of excitatory presynaptic development. Our previous analysis showed that in CA3 of Fgf22-/- mice, synaptic connections are made, but synaptic vesicles fail to appropriately accumulate to the presynaptic terminals (Terauchi et al., 2010). In Fgf22-/- cultures, the accumulation of glutamatergic synaptic vesicles, as assessed by the number and size of VGLUT1 (vesicular glutamate transporter 1) puncta, onto dendrites of CA3 pyramidal neurons is specifically impaired (Terauchi et al., 2010; also see Figure 7A). We examined whether application of IGF2 could rescue the defects in synaptic vesicle accumulation in Fgf22-/- cultures. 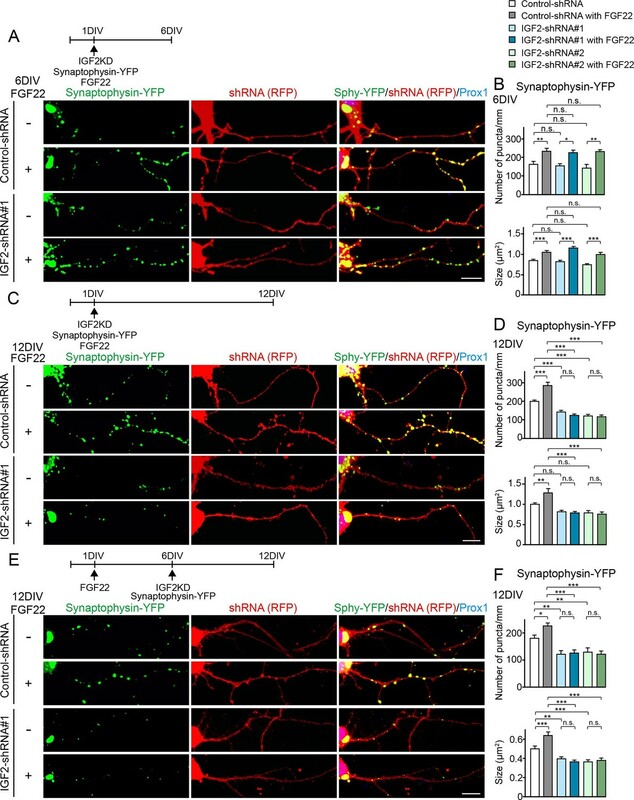 In WT cultures, bath application of IGF2 increased the clustering of glutamatergic synaptic vesicles on the dendrites of CA3 pyramidal neurons at 13DIV (Figure 7A); consistent with this result, IGF2 overexpression increased synaptophysin-YFP puncta in DGCs (Figure 5A, Figure 6E and F). In Fgf22-/- cultures, IGF2 application rescued the defects in VGLUT1 accumulation: the restored number and size of VGLUT1 puncta were comparable to those seen in IGF2-treated WT cultures (Figure 7A). IGF2 treatment, as well as deficiency of FGF22, did not alter the clustering of VGAT (vesicular GABA transporter; a marker of GABAergic synaptic vesicles) on the dendrite of CA3 pyramidal neurons, indicating that IGF2 and FGF22 are not involved in inhibitory presynaptic development on CA3 pyramidal neurons (Figure 7B). In addition, IGF2 treatment and loss of FGF22 did not change the accumulation of postsynaptic markers, PSD95 (glutamatergic) and gephyrin (GABAergic), associated with CA3 pyramidal neurons (Figure 7C and D). 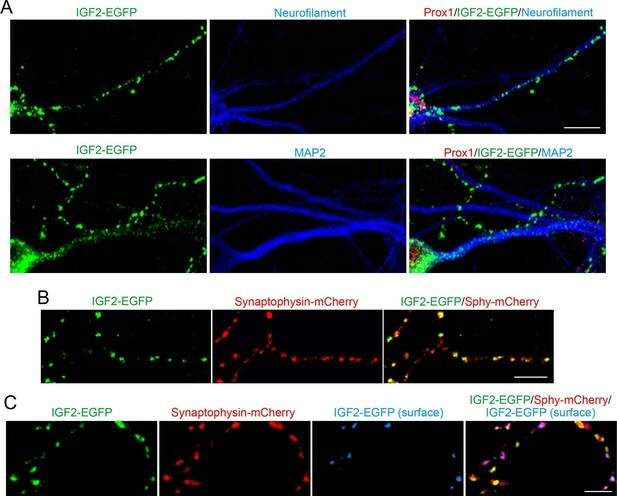 Altogether, IGF2 specifically rescues excitatory presynaptic defects in Fgf22-/- neurons, suggesting that IGF2 is a mediator of FGF22 signaling to promote excitatory presynaptic development on the dendrites of CA3 pyramidal neurons. IGF2 treatment rescues the impairment of glutamatergic presynaptic development in Fgf22-/- cultures. Hippocampal neurons from WT and Fgf22-/- mice were cultured with or without IGF2 treatment. IGF2 was applied into culture media at 1DIV, and cells were fixed and stained at 13DIV. (A) VGLUT1 clustering on the dendrites of CA3 pyramidal neurons (immunolabeled with Py antibody). IGF2 treatment increases VGLUT1 clustering in WT culture and rescues defects in VGLUT1 clustering in Fgf22-/- cultures. (B–D) Application of IGF2 does not change VGAT clustering (B), PSD95 clustering (C), and gephyrin clustering (D) on the dendrites of CA3 pyramidal neurons in WT and Fgf22-/- cultures. The density (number/mm) and size of VGLUT1, VGAT, PSD95 and gephyrin puncta on CA3 pyramidal neurons were analyzed and shown in the graphs. Error bars are s.e.m. Data are from 12–39 cells from 3–7 independent experiments. Significant difference from control at *p<0.05, **p<0.01 and ***p<0.001 by two-way ANOVA followed by Tukey's multiple comparison test. n.s. : no statistical significant difference. Scale bars, 10 μm. We then asked whether IGF2 is necessary for FGF22-dependent excitatory presynaptic development. Defects in excitatory synapse formation are observed in the CA3 region of the hippocampus in Fgf22-/- mice as early as P8, an early stage of synapse formation (Terauchi et al., 2010). Meanwhile, decreased IGF2 expression was observed in Fgf22-/- mice at P14, but not at P7 (Figure 1), and the effects of IGF2 on presynaptic development is activity-dependent (Figure 6C–F). These results raise the possibility that IGF2 contributes to FGF22-dependent presynaptic development in a stage-specific manner: IGF2 is not required during the initial stage but is required during the following stage of synapse formation, i.e., activity-dependent synapse stabilization. To test this possibility, we employed an shRNA knockdown approach (Figure 8—figure supplement 1) to silence the expression of IGF2 in DGCs from 1DIV by using two independent shRNA plasmids. Knockdown of IGF2 did not apparently alter the morphology of DGCs (Figure 8—figure supplement 2). We assessed synaptic vesicle (synaptophysin-YFP) accumulation in response to FGF22 in the axons of IGF2-knockdown DGCs (from 1DIV) during the initial presynaptic differentiation (6DIV) and subsequent presynaptic stabilization (12DIV) stages. At 6DIV, we did not observe any differences between IGF2-knockdown and control DGCs: the basal levels of synaptophysin-YFP accumulation were not different, and IGF2-knockdown DGCs still responded to FGF22 treatment to increase the accumulation of synaptophysin-YFP (Figure 8A and B). On the other hand, at 12DIV, the number and size of synaptophysin-YFP puncta were significantly decreased in IGF2-knockdown DGCs compared to those in controls (Figure 8C and D). In addition, IGF2-knockdown DGCs no longer show FGF22-dependent increases in the accumulation of synaptophysin-YFP (Figure 8C and D). These results suggest that IGF2 is not necessary for the initial presynaptic differentiation induced by FGF22, but is required for a later stage of presynaptic development. To confirm the role of IGF2 in the late stage of presynaptic development, we knocked down IGF2 from 6DIV and assessed presynaptic development at 12DIV. IGF2 knockdown from 6DIV decreased the number and size of presynaptic terminals (as assessed by synaptophysin-YFP accumulation) and blocked the synaptogenic effects of FGF22 at 12DIV (Figure 8E and F), suggesting that IGF2 is indeed critical for the later stage of presynaptic stabilization. IGF2 is dispensable for FGF22-dependent initial presynaptic differentiation, but is required for subsequent presynaptic stabilization. (A-D) Cultured hippocampal neurons were transfected with the plasmid expressing synaptophysin-YFP together with the plasmid expressing either control-shRNA, IGF2-shRNA#1, or IGF2-shRNA#2 at 1DIV. FGF22 was applied into culture media after the transfection at 1DIV. Cells were fixed, stained, and clustering of synaptophysin-YFP in DGCs was analyzed at 6DIV or 12DIV. (A and B) Clustering of synaptophysin-YFP in DGCs at 6DIV. Quantification of the number and size of synaptophysin-YFP clusters in DGCs are shown in the graph (B). FGF22 treatment increases the number and size of synaptophysin-YFP puncta in both control and IGF2-knockdown DGCs. (C and D) Clustering of synaptophysin-YFP in DGCs at 12DIV. Quantification of the number and size of synaptophysin-YFP clusters are shown in the graph (D). Without IGF2, the effects of FGF22 on synaptophysin-YFP clustering disappear. (E and F) Cultured hippocampal neurons were treated with FGF22 at 1DIV. At 6DIV, neurons were transfected with the plasmid expressing synaptophysin-YFP together with the plasmid expressing either control-shRNA, IGF2-shRNA#1, or IGF2-shRNA#2. Cells were fixed and stained at 12DIV. Quantification of the number and size of synaptophysin-YFP clusters are shown in the graph (F). IGF2-knockdown at a late stage of synapse development (from 6DIV) decreases synaptophysin-YFP clustering and blocks the synaptogenic effects of FGF22 in DGCs. Error bars are s.e.m. Data are from 12–62 cells from 5–8 independent experiments. Significant difference from control at *p<0.05, **p<0.01 and ***p<0.001 by two-way ANOVA followed by Tukey’s multiple comparison test. n.s. : no statistical significant difference. Scale bars, 10 μm. Finally, to investigate whether and at which developmental stages IGF2 is necessary for excitatory presynaptic development in vivo, we examined clustering of excitatory synaptic vesicles in CA3 of Igf2-/- mice from P8 to P29. In the hippocampus, synapse development from P0 to ~P14 is not apparently influenced by neural activity ("initial synapse differentiation"), but that from ~P14 to ~P28 is regulated by activity, where activity-dependent synapse maturation (e.g., Toth et al., 2013) and activity-dependent synapse elimination (Yasuda et al., 2011) take place. We found that at P8, clustering of VGLUT1 in CA3 of Igf2-/- mice was similar to that of WT mice (Figure 9A–D). 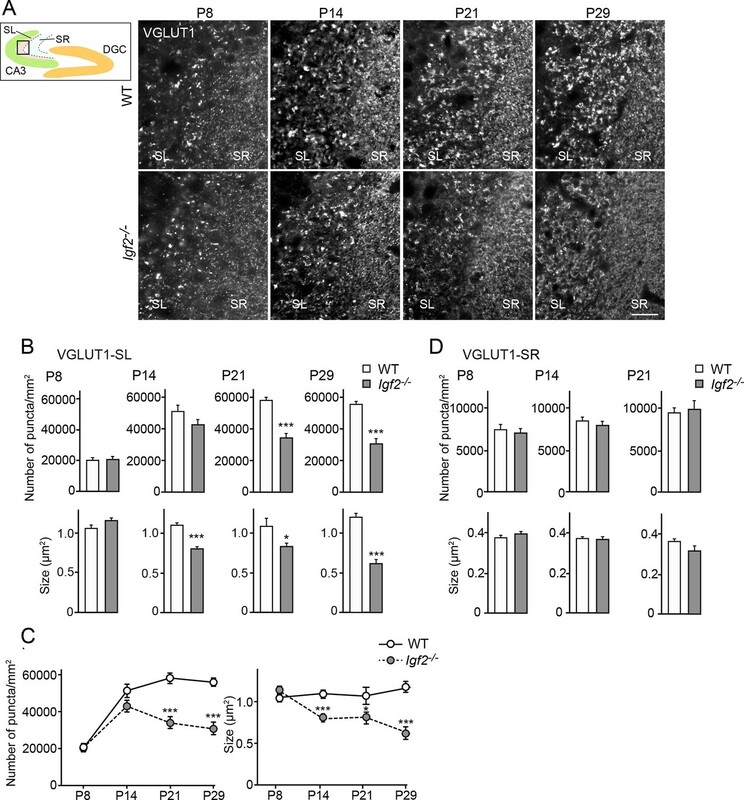 At P14, Igf2-/- mice still had a similar number of VGLUT1 puncta, but their size was smaller in the CA3 stratum lucidum (SL) region, where the axons of DGCs form excitatory synapses with CA3 pyramidal neurons. At P21 and P29, Igf2-/- mice showed a significant decrease in the number and size of VGLUT1 puncta in the SL layer (Figure 9A–C). The targeting of DGC axons to CA3 appeared normal in Igf2-/- mice (Figure 9—figure supplement 1). No defects were observed in the CA3 stratum radiatum (SR) region, where CA3 to CA3 synapses are located, throughout the time periods we examined (Figure 9A and D). These results suggest that IGF2 is critical for a later stage (after P14) of DGC–CA3 synapse development, but not for CA3–CA3 synapse development. Glutamatergic presynaptic stabilization is impaired at the DGC–CA3 synapses in Igf2-/- mice. Hippocampal sections from WT and Igf2-/- mice at P8, P14, P21, and P29 were immunostained for VGLUT1. The illustration shows the pictured area (boxed). (A) Representative pictures from CA3 regions. SL: stratum lucidum (DGC–CA3 synapses); SR: stratum radiatum (CA3–CA3 synapses). Density and size of VGLUT1 puncta are quantified and shown in (B: SL) and (D: SR). (C) Time course of VGLUT1 clustering in the SL layer. In the SL layer, Igf2-/- mice show no presynaptic defects at P8, but start to show mild defects at P14, and exhibit significant defects at P21 and P29. No significant defects were observed in the SR layer. Error bars are s.e.m. Data are from (B and C) 23–42 fields from 3–5 independent experiments, (D) 13–34 fields from 3–5 independent experiments. Significant difference from control at *p<0.05 and ***p<0.0001 by Student's t-test. Scale bar, 20 μm. To further understand the role of IGF2 in synaptic development, we analyzed ultrastructure of excitatory (asymmetric) synapses in the SL and SR layers of CA3 in Igf2-/- mice at P28–P29. Both in the SL and SR layers, the number and size of postsynaptic densities were similar between WT and Igf2-/- mice (Figure 10). In the presynaptic terminals in the SL layer of Igf2-/- mice, there were fewer synaptic vesicles, less clustering of synaptic vesicles, fewer docked vesicles, and smaller synaptic vesicles relative to WT mice (Figure 10A and B). In contrast, no structural defects were found in the SR layer of Igf2-/- mice (Figure 10C and D). Together with the immunostaining results (Figure 9), our results suggest that in Igf2-/- mice, synaptic vesicles were not stabilized/maintained in the presynaptic terminals specifically at the DGC–CA3 synapses. Electron microscopic analysis shows defects in excitatory presynaptic terminals selectively in the SL layer of Igf2-/- mice. Electron microscopic analysis of asymmetric (excitatory) synapses in WT and Igf2-/- mice (P28–29). (A and B) Asymmetric synapses in the CA3 SL layer. (A) Two representative images of asymmetric synapses in WT and Igf2-/- mice. (B) Quantification of synaptic vesicles (SVs) and postsynaptic densities (PSDs). Number of SVs within 400 nm from the active zone (total SV), % SVs within 150 nm from active zone, number of docked vesicles per synapse, size of SVs, number of PSDs in 100 nm2, and length of PSDs are shown. (C and D) Asymmetric synapses in the CA3 SR layer. (C) Representative images of asymmetric synapses in WT and Igf2-/- mice. (D) Quantification of SVs and PSDs. Igf2-/- mice show a loss of SVs in the SL layer, but not in the SR layer, without apparent changes in PSDs. Error bars indicate s.e.m. Data are from 14–50 synapses from 12–13 fields from 2 mice per strain. Significant differences from WT mice at ***p<0.0001 by Student's t-test. Scale bars, 100 nm. To address the physiological consequences of IGF2 deficiency in synaptic function, we recorded synaptic current from the CA3 region of the hippocampus from adult WT and Igf2-/- mice. The frequency but not the amplitude of miniature excitatory postsynaptic currents (mEPSCs) was significantly decreased in CA3 pyramidal neurons of adult Igf2-/- mice (Figure 11A and B), suggesting that loss of IGF2 has a prolonged impact on excitatory presynaptic function, without significantly affecting postsynaptic function. To examine whether synaptic defects are specific to DGC–CA3 connections, we recorded evoked field excitatory postsynaptic potentials (fEPSPs) at DGC–CA3 or CA3–CA3 synapses (Figure 11C). fEPSP responses were verified as DGC–CA3 or CA3–CA3 based on the sensitivity to DCG-IV, the group 2 mGluR agonist that selectively blocks DGC–CA3 responses (red traces in Figure 11C; Nicoll and Schmitz, 2005). The fEPSP slope was significantly smaller in Igf2-/- than WT mice for DGC–CA3 responses (Figure 11C), but not for CA3–CA3 responses. Paired-pulse facilitation at DGC–CA3, but not CA3–CA3, synapses was decreased in Igf2-/- mice relative to WT mice (Figure 11D). Taken together, these results suggest that excitatory synaptic transmission at DGC–CA3 synapses is specifically impaired in Igf2-/- mice due to the loss of synaptic vesicles from the presynaptic terminals. Excitatory synaptic transmission at DGC–CA3 synapses, but not CA3–CA3 synapses, is specifically impaired in Igf2-/- mice. (A and B) Whole-cell recordings of mEPSCs from CA3 pyramidal neurons of adult WT and Igf2-/- hippocampal slices. (A) Representative traces of mEPSCs. (B) Quantification of the frequency and amplitude of mEPSCs. The frequency, but not amplitude, of mEPSCs is specifically decreased in CA3 of Igf2-/- mice. 31–32 cells from 5 mice per genotype. *p<0.05 by Student’s t-test. (C) fEPSP responses evoked in the CA3 region of the hippocampus. Responses were characterized as either DGC–CA3 or CA3–CA3 based upon sensitivity to DCG-IV treatment. Black traces: original responses, red traces: after 10 min of DCG-IV treatment. Graphs show the quantification of the maximum fEPSP slope. At DGC–CA3 synapses, the maximum elicited response is significantly smaller in Igf2-/- mice than in WT mice (n = 8 and 8; **p<0.01 by Student’s t-test). At CA3–CA3 synapses, the maximum elicited response is not different between WT and Igf2-/- mice (n = 14 and 24; p = 0.71 by Student’s t-test). (D) Paired pulse facilitation (PPF). PPF at the DGC–CA3 synapses, and not CA3–CA3 synapses, is significantly decreased in Igf2-/- mice (***p<0.0001 by Two-way ANOVA followed by a Tukey test). Example traces demonstrate responses with a 50 ms inter-stimulus interval. In this study, we identified Igf2 as a target gene induced by the presynaptic organizer FGF22 and showed that in the mammalian hippocampus: i) IGF2 localizes to presynaptic terminals of DGCs and promotes their maturation in an activity-dependent manner; ii) IGF2 can rescue excitatory presynaptic defects in Fgf22-/- neurons; iii) IGF2 is required for FGF22-dependent presynaptic stabilization, but not for initial presynaptic differentiation; and iv) Igf2-/- mice show presynaptic defects at DGC–CA3 synapses during synaptic stabilization. Together, we propose a novel, activity-dependent feedback signaling pathway for presynaptic stabilization in the mammalian brain: target-derived FGF22 induces the presynaptic expression of IGF2, and IGF2 in turn, localizes to the presynaptic terminals in an activity-dependent manner for their stabilization (Figure 12). A Model showing a feedback signal for activity-dependent presynaptic stabilization. For initial presynaptic differentiation, target-derived FGF22 locally promotes clustering of synaptic vesicles. For subsequent presynaptic stabilization, FGF22 signaling induces the expression of IGF2. IGF2, in turn, localizes to presynaptic terminals in an activity-dependent manner and stabilizes them. In Drosophila motor neurons, target-derived Gbb signaling induces the expression of Trio in the presynaptic neurons; Trio is then transported back to the nerve terminal and stabilizes cytoskeletal structures of nerve terminals (Ball et al., 2010). In contrast, in the mammalian brain, such feedback pathways for presynaptic stabilization had not been identified. We focused on FGF signaling, because gene expression is one of the most significant outcomes of FGF signaling (Dorey and Amaya, 2010; Partanen, 2007). Thus, FGF-dependent gene expression is poised to have important effects on neuronal network development. Here, we have shown that the FGF22–IGF2 signaling serves as a feedback pathway important for the stabilization of DGC presynaptic terminals in the mammalian hippocampus. An important next question is how IGF2 stabilizes presynaptic terminals. IGF2, which often acts as an autocrine factor (Pollak et al., 2004), mediates its functions mainly via IGF2 receptor (IGF2R) as well as via IGF1 receptor (IGF1R) (Fernandez and Torres-Aleman, 2012). In neurons, both receptors are used to mediate IGF2 signal and participate in various physiological functions (Agis-Balboa et al., 2011; Chen et al., 2011; Schmeisser et al., 2012). We showed that IGF2 is secreted and tethered on the surface of presynaptic terminals of DGCs (Figure 4C). IGF2R (Figure 4—figure supplement1) and IGF1R (Gazit et al., 2016) are also localized at presynaptic terminals. These results suggest that IGF2 is secreted from the presynaptic terminal and binds to IGF2R/IGF1R, which is also localized at the presynaptic terminal, so that IGF2 acts locally in an autocrine manner for its effects. Yet, we cannot exclude the possibility that IGF2 may also act as a global presynaptic organizer if IGF2 is released from the presynaptic terminal. IGF1R is a receptor tyrosine kinase, which may regulate local translation, and IGF2R is known to signal through G proteins, which may ultimately affect calcium homeostasis. Calcium homeostasis and local translation of synaptic proteins, as well as regulation of cytoskeletal structures like Trio may all contribute to IGF2-dependent presynaptic stabilization. Neural activity is involved in synaptic stabilization. It has been proposed that active synapses are stabilized and inactive ones are destabilized (Lichtman and Colman, 2000; Ruthazer and Cline, 2004). Various forms of activity are involved: in most cases, synaptic transmission and synaptic competition are considered critical for synapse refinement (Lichtman and Colman, 2000; Waites et al., 2005). In addition, intrinsic activity also plays critical roles in synapse development (Johnson-Venkatesh et al., 2015). However, the molecular mechanisms by which intrinsic activity contributes to synapse stabilization during development are largely unknown. We found that IGF2's function in synaptic stabilization requires intrinsic neuronal activity (Figure 6). IGF2 is not transported to presynaptic terminals when intrinsic neuronal excitability of DGCs is suppressed. Thus, our results reveal that IGF2 is a mediator of intrinsic activity-dependent presynaptic stabilization. 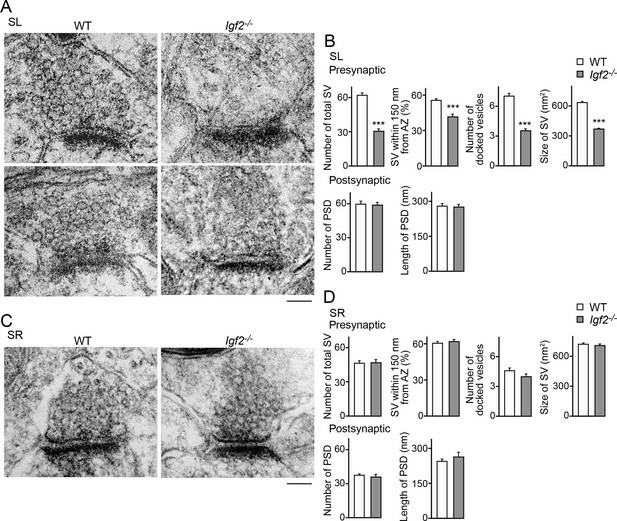 Since IGF2's effects are for the stabilization of synaptic vesicles but not for the initial recruitment of synaptic vesicles (which is carried out by FGF22), it is reasonable that TTX/Kir2.1 did not affect synaptic vesicle transportation (Figure 6). How does intrinsic activity regulate IGF2 localization? Neural activity is known to control motor function of KIF proteins and regulate intracellular transport of synaptic components, such as mitochondria and AMPA receptors (Hoerndli et al., 2015; Saxton and Hollenbeck, 2012). Neural activity also modulates phosphorylation of the C terminal domain of KIF3A, which affects loading of N-cadherin containing cargos and contributes to the maintenance of homeostatic synaptic plasticity (Ichinose et al., 2015). Thus, neural activity may regulate the IGF2 transport complex through phosphorylation of motor proteins. It will be interesting to investigate the mechanisms of IGF2 transport to presynaptic terminals and how neural activity regulates the transport. In addition, neural activity may regulate the secretion of IGF2. Neural activity controls exocytotic secretion of cytoplasmic vesicles in neurons: in olfactory bulb neurons, K+-induced depolarization activates the exocytotic Ca2+-sensor, synaptotagmin-10, to induce secretion of IGF1 (Cao et al., 2011). Thus, in addition to transportation, secretion of IGF2 at presynaptic sites might also be controlled by neural activity. If this is the case, one may speculate that activity blockade would increase the intracellular IGF2 levels. However, we did not observe an increase in the intracellular IGF2 levels, probably because neural activity is also critical for IGF2 transportation (Figure 6). It is also possible that various activity-dependent genes might influence IGF2/IGF2R localization, which is an interesting future study. Our Kir2.1 experiments, in which Kir2.1 was sparsely transfected so that we can ignore effects from postsynaptic neurons, suggest that changes in postsynaptic activity do not play critical roles in IGF2 localization and function. In addition to presynaptic stabilization, signals propagated from target-derived molecules may influence further cell-wide development of the presynaptic neurons. In the mammalian brain, signaling from target-derived neurotrophins has been well characterized. For example, nerve growth factor (NGF) signaling regulates gene expression, including TrkA, p75, Bdnf, and Ntf5, and controls cell survival and death of own and neighboring neurons (Ascano et al., 2012; Deppmann et al., 2008; Singh et al., 2008) as well as dendritic development (Sharma et al., 2010). Since IGF2 has been shown to exhibit broad functions in the brain, IGF2 may not only contribute to presynaptic stabilization, but also various aspects of cell-wide development, including neurogenesis, neurite growth, and spine maturation. For neurogenesis, IGF2 is implicated in maintenance and expansion of neural stem cells (Ziegler et al., 2012; 2014) and proliferation of neuronal progenitor cells (Burns and Hassan, 2001; Lehtinen et al., 2011) in the developing brain. IGF2 also contributes to adult neurogenesis in the subgranular zone of the hippocampus (Bracko et al., 2012; Ouchi et al., 2013). For neuronal development, IGF2 leads to nerve sprouting (Caroni and Grandes, 1990), neurite outgrowth (Jeong et al., 2013), as well as spine maturation in cultured hippocampal neurons (Schmeisser et al., 2012). Thus, IGF2 may serve as a general regulator of the development of presynaptic neurons (DGCs) downstream of FGF22. Since IGF2 is still expressed in calbindin-positive DGCs in Fgf22-/- mice (Figure 1), IGF2 can be expressed in an FGF22-independent manner as well. Indeed, IκB, which is not utilized by FGF22 signaling, has been shown to induce expression of IGF2 for spine maturation in mature hippocampal neurons (Schmeisser et al., 2012). The expression of the mouse Igf2 gene is regulated by three alternative promoters (Sasaki et al., 1992). Thus, different signals seem to be used to regulate distinct phases of neuronal development. The presynaptic effects of IGF2 are stage and cell-type specific. FGF22-dependent IGF2 expression was observed in young, calretinin-positive DGCs, but not in mature, calbindin-positive DGCs (Figures 1–3). Specific responsiveness of calretinin-positive DGCs to FGF22 appears to be linked to the developmental stage. Calretinin-positive DGCs elongate axons to CA3 and contact CA3 pyramidal neurons to form synapses (Aguilar-Arredondo et al., 2015; Li et al., 2009; Ming and Song, 2005; Yasuda et al., 2011). Thus, around that stage, DGCs may become more responsive to FGF22. Our results are consistent with the idea that IGF2 is induced by CA3-derived FGF22 when DGC axons contact with their target dendrites. The data from CA3-selective Fgf22 knockout mice (Figure 2) and the local FGF22 application experiments, in which IGF2 was induced by axonal application of FGF22 (Figure 3F–I), further support this idea. Our results also suggest that IGF2 is not critical for initial synaptic differentiation, because no defects were found in the absence of IGF2 at 6DIV in vitro (Figure 8A,B) or P8 in vivo (Figure 9). However, it is important for the later stages of synapse development: after 6DIV in vitro (Figure 8E,F) and P14 in vivo (Figure 9), when neural activity influences synapse formation (Toth et al., 2013; Yasuda et al., 2011). As IGF2 effects are activity dependent (Figure 6), we propose that IGF2, induced by target-derived FGF22, is mainly important for the stages of activity-dependent synapse stabilization. Interestingly, induction of IGF2 by FGF22 is specific to DGCs. CA3 pyramidal neurons, which release FGF22, receive excitatory synaptic inputs from collateral/associational CA3 pyramidal neurons and stellate cells in the entorhinal cortex, in addition to inputs from DGCs (Urban et al., 2001). However, CA3 neurons do not respond to FGF22 to induce IGF2 (Figure 3). Since Fgf22-/- mice show defects in excitatory synapse formation both in the SL (where DGC to CA3 synapses are located) as well as SR (where CA3 to CA3 synapses are located) (Terauchi et al., 2010), the lack of IGF2 induction in CA3 neurons indicates that IGF2 is a unique target of FGF22 specifically in differentiating DGCs. It is possible that CA3 neurons express genes other than IGF2 in an FGF22-dependent manner for presynaptic stabilization. If so, different types of presynaptic neurons might process FGF22 signaling through their own transcription regulation to promote neuron type-specific presynaptic stabilization. It is worth noting that many synapse organizing molecules show input specificity. FGF22 affects synapse formation in the SR and SL layers of CA3, but not the SLM (stratum lacunosum moleculare) layer (Terauchi et al., 2010). Neuroligins in cerebellar Purkinje cells have a role in the formation of climbing fiber synapses, but not parallel-fiber synapses (Zhang et al., 2015). Cadherin-9 is involved in the formation and differentiation of DGC–CA3 synapses, but not CA3–CA3 synapses (Williams et al., 2011). Neuroligin2 regulates inhibitory synaptic function in a pathway-specific manner (Gibson et al., 2009). Thus, it appears that there are input specific synaptic organizers that cooperate to establish precise networks in the brain. Our work on IGF2, which is specific to DGC–CA3 synapses, would add an example of how our brain utilizes specific molecules to emerge synapse specificity. It will be also interesting to examine whether stabilization of inhibitory synapses is regulated by a similar feedback pathway. In CA3, FGF7 acts as a target-derived presynaptic organizing molecule for inhibitory synapses (Terauchi et al., 2010). Our preliminary screen suggests that FGF22 and FGF7 may regulate distinct molecules in excitatory (DGCs) vs. inhibitory neurons for synapse stabilization, because Igf2 was not identified as a target gene of FGF7. IGF2 is implicated in behavioral phenotypes such as fear extinction (Agis-Balboa et al., 2011; Agis-Balboa and Fischer, 2014), depression (Luo et al., 2015), and memory consolidation and enhancement in rodents (Chen et al., 2011; Pascual-Lucas et al., 2014). 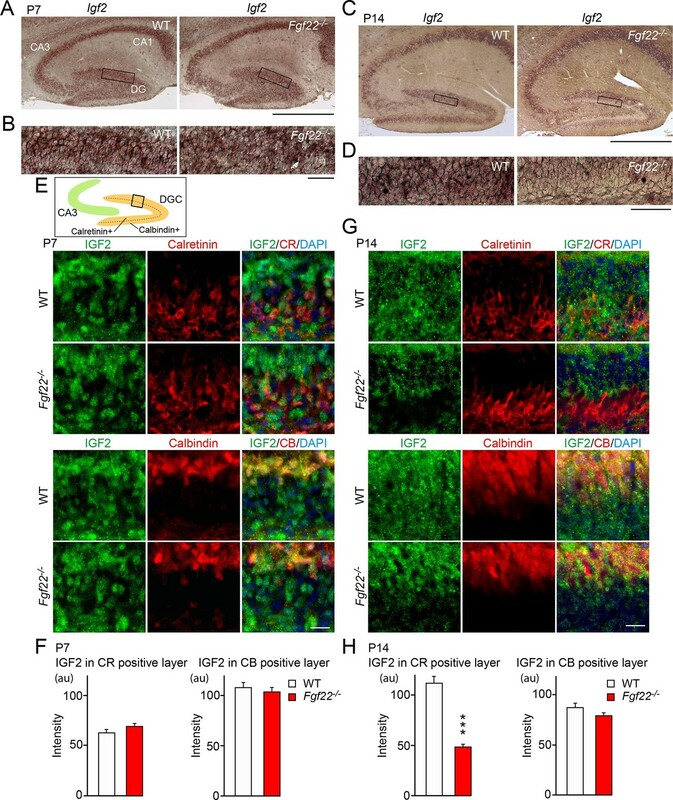 Administration of IGF2 rescues spine formation and excitatory synaptic function in the hippocampus of a mouse model of Alzheimer’s disease (Pascual-Lucas et al., 2014). In addition, Igf2-/- mice are resistant to acquiring epileptiform events in response to kainate administration (Dikkes et al., 2007). Interestingly, Fgf22-/- mice show seizure resistant phenotype (Terauchi et al., 2010) and depression-like behavior (Williams et al., 2016). Thus, defects in synapse stabilization through the FGF22–IGF2 pathway may be involved in diseases like epilepsy and depression. Our work may help develop new treatment strategies for such neuropsychiatric disorders. Fgf22-/- mice were described previously (Terauchi et al., 2010). The strain was maintained on the C57/BL6 background. Fgf22flox/flox mice (Fgf22tm1a(EUCOMM)Hmgu) were from EUCOMM. Grik4-Cre mice were from Jackson (Nakazawa et al., 2002). Igf2-/- mice were described previously (Lehtinen et al., 2011). Both males and females of these knockout and littermate control mice were used in our study. C57/BL6 or ICR mice (Jackson Laboratory and Charles River Laboratories) were used to prepare cultures. All animal care and use was in accordance with the institutional guidelines and approved by the Institutional Animal Care and Use Committees at Boston Children’s Hospital and University of Michigan. DGCs were dissected from P14 WT and Fgf22-/- mice (n=4 per genotype). RNA was prepared with the RNeasy kit (Qiagen, Germantown, MD), and its quality was verified with Agilent Bioanalyzer using PICO chips. Microarray was performed on Illumina Bead station 500 with mouse-6 expression beadchip. Igf2 was identified as one of the most down-regulated genes in Fgf22-/- DGCs (Diff Score = -43; see Table 1). In situ hybridization was performed as described (Schaeren-Wiemers and Gerfin-Moser, 1993). Digoxigenin-labeled cRNA probes were generated by in vitro transcription using DIG RNA labeling mix (Roche, Switzerland). The probe for Igf2 was generated from the 3' untranslated region of the mouse Igf2 cDNA (Open Biosystems, Lafayette, CO). In situ images were taken with a Nikon Coolpix 990 distal camera (Nikon, Japan) attached to an Olympus BX61 upright microscope (Olympus, Japan) under bright-field optics with 4x, 10x and 20x objective lenses. The expression plasmid for IGF2 was generated by subcloning the full-length mouse Igf2 cDNA into the NheI/XhoI sites of APtag-5 (GenHunter, Nashville, TN). The expression plasmid for IGF2-EGFP was generated by subcloning the full-length mouse Igf2 cDNA (minus the stop codon) into the NheI/HindIII sites of pEGFP-N1 (Clontech, Mountain View, CA) in frame. The expression plasmid for Kir2.1 was generated by subcloning the full-length Kir2.1 cDNA into SmaI/XhoI sites of pCMV-SPORT6. The IGF2 specific shRNA expression plasmids were constructed using synthetic oligonucleotides, which were cloned into the BamHI/HindIII sites of the HuSH shRNA vector (pRFP-C-RS, OriGene, Rockville, MD). The following shRNA targeting sequences were used: IGF2-shRNA#1, CGGACCGCGGCTTCTACTTCAGCAGGCCT and IGF2-shRNA#2, GTTGGTGCTTCTCATCTCTTTGGCCTTCG. The efficiency of shRNA-mediated knockdown of IGF2 was confirmed by co-transfecting each IGF2 shRNA plasmid with the IGF2-EGFP plasmid into cultured hippocampal neurons and measuring the total EGFP fluorescence intensity relative to control shRNA transfected neurons (Figure 8—figure supplement 1). The synaptophysin-YFP plasmid was described previously (Terauchi et al., 2010; Toth et al., 2013; Umemori et al., 2004). The synaptophysin-mCherry plasmid was a kind gift from M. Sutton (University of Michigan). Hippocampi were dissected from P0 mice, and hippocampal cells were dissociated in a solution containing 0.5% trypsin and 0.02% DNase I as described previously (Terauchi et al., 2010). 3–5 x 104 hippocampal cells were plated on a poly-D-lysine coated glass coverslip (diameter 12 mm, No.1, Carolina Biological, Burlington NC) and cultured in neurobasal media supplemented with B27 (Invitrogen, Waltham, MA). Transfection was performed using the CalPhos Mammalian transfection kit (Clontech). Cultured cells were transfected at 1–3DIV with 1.5–2.2 μg of plasmid DNA per coverslip. Recombinant FGF22 and IGF2 (both from R&D systems, Minneapolis, MN) were applied at 2 nM (FGF22) or 1.35 nM (IGF2) into culture medium at 1–3DIV. For neuronal activity blockade, TTX was applied at 1 μM into culture medium every fourth day stating at the time of transfection or factor application. The chambers fabricated in polydimethylsiloxane (Xona Microfluidics SND450, Xona Microfluidics, Temecula, CA) were placed on a poly-D-lysine coated glass coverslip (25 x 25 mm, No.1, Carolina Biological) by physical contact. The chamber consists of two microfluidic compartments, somal and axonal sides, which are connected via microgrooves with a high fluidic resistance. Hippocampal cells (22,500 cells) were plated in the somal side compartment. Fluidic isolation of the axonal side compartment was established by applying 180 μl of media in the somal side and 110 μl in the axonal side. At 2DIV, 2.5 nM of FGF22 was applied into the axonal compartment. Cells were stained at 8DIV. Mouse brains were perfused with 4% paraformaldehyde (PFA) in PBS followed by further fixation in 4% PFA in PBS overnight. Sagittal and coronal sections were prepared on a cryostat (16–20 μm thick), and processed for staining. For IGF2 staining, sections were treated with methanol for 5 min at -20°C. For IGF2 staining together with calbindin or calretinin staining, sections were treated with acetone for 2 min at -20°C. Cultures were fixed with 3 or 4% PFA for 10 min at 37°C or methanol for 2–5 min at -20°C and stained as described previously (Terauchi et al., 2010). For immunostaining for IGF2, cultures were fixed with acetone for 2–3 min at -20°C. Dilutions and sources of antibodies are: monoclonal anti-calbindin (1:200; Sigma-Aldrich, St. Louis, MO; C9848), goat anti-calbindin (1:500; Frontier Institute, Japan), monoclonal anti-calretinin (1:200; Millipore, Billerica, MA; MAB1568), rabbit anti-calretinin (1:500; Synaptic Systems, Germany; 214102), monoclonal anti-Prox1 (1:1500; Millipore; MAB5652), rabbit anti-Prox1 (1:500; Millipore; AB5475), anti-VGLUT1 (1:5000; Millipore; AB5905), anti-VGAT (1:1500; Synaptic Systems; 131003), anti-PSD95 (1:700; Affinity Bioreagents, Golden, CO; MA-045 and 1:250; NeuroMab, Davis, CA; 75–028), anti-gephyrin (1:150; Synaptic Systems; 147021), anti-MAP2 (1:3000; Sigma-Aldrich; M4403), anti-neurofilament (1:1000; Covance, Princeton, NJ; SMI-312), rabbit anti-GFP (1:1000; Millipore; AB16901), chicken anti-GFP (1:2500; Aves Labs, Tigard, OR; GFP-1020), anti-DsRed (for staining of mCherry to enhance the fluorescence signal, 1:500; Clontech; 632496), anti-IGF2 (1:50 for brain section staining and 1:70 for cultured cell staining; Santa Cruz, Dallas, TX; sc-5622), anti-IGF2R (1:100; Santa Cruz; sc-25462), and antibody Py (1:50; a kind gift from M. Webb and P.L. Woodhams). When cells were co-stained with anti-Prox1 monoclonal antibody with another mouse IgG1 antibody, Zenon Alexa Fluor 568 Mouse IgG1 Labeling Kit (Invitrogen) was used to label anti-Prox1 monoclonal antibody. P28–P29 WT and Igf2-/- mice were perfused transcardially with fixative (2% PFA and 2.5% glutaraldehyde in 0.1 M cacodylate buffer pH 7.4), and their brains were postfixed for overnight. Hippocampi were removed, cross-sections (250 μm thick) were prepared, and small pieces (about 0.6 mm x 0.6 mm x 0.25 mm) of the SL and SR layers of the CA3 region were dissected. Dissected pieces were postfixed overnight, washed with 0.1 M cacodylate buffer pH 7.4, and treated with 2% osmium tetroxide in 0.1 M cacodylate buffer or 1.5% potassium ferrocyanide, 2% osmium tetroxide in 0.1 M cacodylate buffer for 1–5 hr. The samples were then rinsed with water, stained en bloc with 3% uranyl acetate for 1 hr, dehydrated in graded alcohols and propylene oxide, and embedded in TAAB 812 Resin (Canemco-Marivac, Canada). Blocks were kept for 48 hr at 60°C to complete polymerization. Both semi- and ultra-thin sections (10 and 70 nm) were prepared with Diatome Histo and Diatome Ultra 45° diamond knives, respectively, on Leica UC7 ultramicrotome (Leica, Germany), and observed with Tecnai G2 Spirit BioTWIN Transmission Electron Microscope. The digital images were captured with AMT 2k CCD camera system operated with AMT software (Advanced Microscopy Techniques Corp., Woburn, MA). For mEPSC recordings: Acute hippocampal slices were prepared from 5–7 month old mice. Mice were decapitated and the brains were removed, and 300 µm sections were cut using a Leica VT1000S vibratome. Sections were cut in an ice cold solution containing (in mM): 206 sucrose, 2.8 KCl, 2 MgSO4, 1 MgCl2, 1.25 NaH2PO4, 1 CaCl2, 10 glucose, 26 NaHCO3, and 0.4 ascorbic acid. Then, sections were incubated in an NMDG-HEPES recovery solution, containing (in mM): 92 NMDG, 92 HCl, 2.5 KCl, 10 MgSO4, 0.5 CaCl2, 1.2 NaH2PO4, 20 HEPES, 30 NaHCO3, 25 glucose, 5 sodium ascorbate, 2 thiourea, and 3 sodium pyruvate, for 15 min at 34°C before putting the slices into artificial cerebral spinal fluid (aCSF) for 1 hr at room temperature. aCSF contained (in mM): 124 NaCl, 2.8 KCl, 2 MgSO4, 1.25 NaH2PO4, 2 CaCl2, 10 glucose, 26 NaHCO3, and 0.4 ascorbic acid. All solutions were continuously bubbled with 95% O2/5% CO2. Neurons were visualized using a customized Scientifica/Olympus microscope. Data were obtained with a Multiclamp 700B amplifier (Axon Instruments, Union City, CA), digitized with Digidata 1440A (Axon Instruments) and collected with Clampex 10.0 (Axon Instruments). Whole-cell patch-clamp recordings were conducted with 4–6 MΩ pipette containing (in mM) 135 K-MeSO4, 7 NaCl, 10 HEPES, 4 Mg-ATP, 0.3 Li-GTP, and 7 phosphocreatine. Cells were held at -70 mV. aCSF was supplemented during recording with 500 nM tetrodotoxin and 50 µM picrotoxin and warmed to 32°C. mEPSCs were analyzed using Minianalysis (Synaptosoft, Decatur, GA). For fEPSP recordings: mice (2–3 months old) were decapitated and the hippocampal lobules cut in the same solution as above. Transverse slices (400 µm) of the hippocampus were then cut using a tissue chopper (Stoelting, Kiel, WI). After slicing, sections were incubated in an NMDG-HEPES recovery solution for 15 min at 34°C before putting the slices into aCSF for 1 hr. Slices were then incubated in aCSF at room temperature for at least 1 hr before recording. Then, slices were transferred to a recording chamber, maintained at 32°C and continuously perfused at 1–2 ml/min with oxygenated aCSF. Recording electrodes were pulled from borosilicate capillary glass and filled with 1 M NaCl, 25 mM HEPES (1.5 mm o.d. ; Sutter Instruments, Novato, CA). The recording pipette was placed in the in the SL or SR layers of the CA3 region of the hippocampus. Recordings were made with a MultiClamp 700B amplifier, collected using Clampex 10.3, and analyzed using Clampfit 10.3. fEPSPs were evoked using cluster electrodes (FHC) placed in the SL or SR layers of the CA3 region of the hippocampus. Current between 0.1–1 mA for 0.1 s was used to elicit a response. Maximum responses were then used for paired-pulse facilitation experiments. 1 µM DGC-IV was then added to the aCSF and the experiments were repeated after 10 min of perfusion with drug. Fluorescent images were taken on epi-fluorescence microscopes (Olympus BX61 and BX63) or confocal microscopes (Olympus FV1000 and Carl Zeiss LSM700, Germany). With epi-fluorescence microscopes, 12-bit images at a 1,376 x 1,032 (Olympus BX61) or 1,376 x 1,038 (Olympus BX63) pixel resolution were acquired with 40x and 20x objective lenses using an F-View II CCD camera (Soft Imaging System, Germany) or an XM10 Monochrome camera (Olympus). With confocal microscopes, 12-bit (FV1000) or 8-bit (LSM700) images at a 1,024 x 1,024 pixel resolution were obtained using 20x, 40x and 63x objective lenses with a 1.0 or 1.5x zoom. Images were acquired as a z-stack (17–20 optical sections, 0.4 μm step size). Images in the same set of experiments were acquired with the identical acquisition settings regarding the exposure time, laser power, detector gain, or amplifier offset. The intensity of stained signals and the size and density of stained puncta were quantified and analyzed using MetaMorph software. For images of hippocampal sections, the staining intensity in the lateral ventricle was calculated as the background signal and subtracted from each image. For images of cultured neurons stained for synaptic proteins, the staining intensity of the dendritic shaft in control cultures was calculated as the background signal and subtracted from each image. For images of cultured neurons stained for anti-IGF2 antibody, the lowest staining intensity in the culture was calculated as the background signal and subtracted from each image. For colocalization analyses, objects were considered to colocalize if more than 25% of the object was overlapped with the other object. The statistical tests performed were two-tailed Student’s t-test or Two-way ANOVA, as indicated in the figure legend. Two-way ANOVA was followed by Tukey's post hoc test. All data are expressed as mean ± s.e.m. No statistical methods were used to pre-determine sample sizes, but our sample sizes were similar to those reported in previous publications in the field (Murata and Constantine-Paton, 2013; Sharma et al., 2010; Terauchi et al., 2010; Toth et al., 2013). No data points were excluded from any experiments. Cellular and Molecular Life Sciences 71:21–42. Reviews in the Neurosciences 26:269–279. Trends in Cell Biology 22:266–273. Frontiers in Cellular Neuroscience, 8, 10.3389/fncel.2014.00058. The Journal of Neuroscience 32:3376–3387. MolMolecular and Cellular Neurosciences 88:377–388. JThe Journal of Cell Biology 110:1307–1317. The Journal of Cell Biology 203:11–22. The Journal of Neuroscience 29:13883–13897. International Journal of Molecular Sciences 12:8924–8946. The European Journal of Neuroscience 32:181–190. Current Topics in Developmental Biology 87:149–174. Excitation, inhibition, local oscillations, or large-scale loops: What causes the symptoms of schizophrenia? Current Opinion in Neurobiology 22:537–544. Molecular and Cellular Neurosciences 6:252–262. Annual Review of Neuroscience 28:223–250. The Journal of Neuroscience 33:5040–5052. The Journal of Neuroscience 33:9408–9419. The Journal of Neuroscience 18:5832–5838. Cold Spring Harbor Perspectives in Biology, 4, 10.1101/cshperspect.a008003. Journal of Cell Science 125:2095–2104. The Journal of Neuroscience 32:5688–5703. Annual Review of Neuroscience 33:473–507. The Journal of Comparative Neurology 314:545–557. Journal of Cell Science 128:281–292. Annual Review of Neuroscience 28:251–274. Cold Spring Harbor Perspectives in Biology, 3, 10.1101/cshperspect.a005744. The Journal of Biological Chemistry 289:4626–4633. Thank you for submitting your work entitled "Retrograde FGF22 signaling regulates IGF2 expression for activity-dependent synapse stabilization in the mammalian brain" for consideration by eLife. Your article has been favorably evaluated by Gary Westbrook (Senior editor) and three reviewers, one of whom is a member of our Board of Reviewing Editors. One of the three reviewers has agreed to reveal his identity: Jaewon Ko. In the rodent hippocampus, synapse formation starts in the first postnatal week, followed by activity-dependent maturation and stabilization stages. The authors previously showed that target-derived FGF22 promoted presynaptic differentiation of excitatory synapses between dentate gyrus granule cells (DGCs) and CA3 pyramidal neurons in the hippocampus (Terauchi et al., Nature 2010). They also showed that another target-derived factor, SIRPα, regulated synapse maturation of DGCs during postnatal weeks 2-4 (Toth et al., Nat Neurosci 2013). In this manuscript, the authors report decreased IGF2 expression in calretinin-positive DGCs in total and CA3-specific FGF22-null mice in vivo, and that bath and local application of FGF22 induced expression of IGF2 specifically in calretinin-positive immature DGCs in vitro. 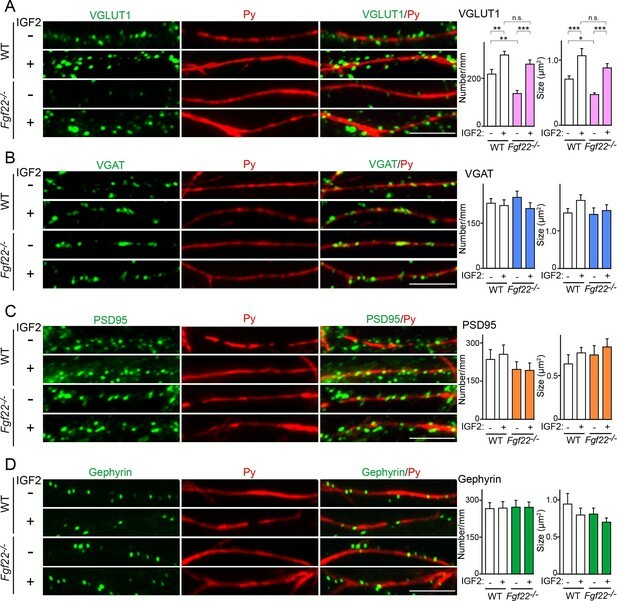 Overexpressed IGF2-EGFP localized to DGC axons in an activity-dependent manner and promoted presynaptic differentiation, as measured by accumulation of synaptophysin-YFP. In addition, treatment with IGF2 restored excitatory presynapse differentiation in FGF22-null CA3 neurons in vitro without changes in postsynaptic markers. 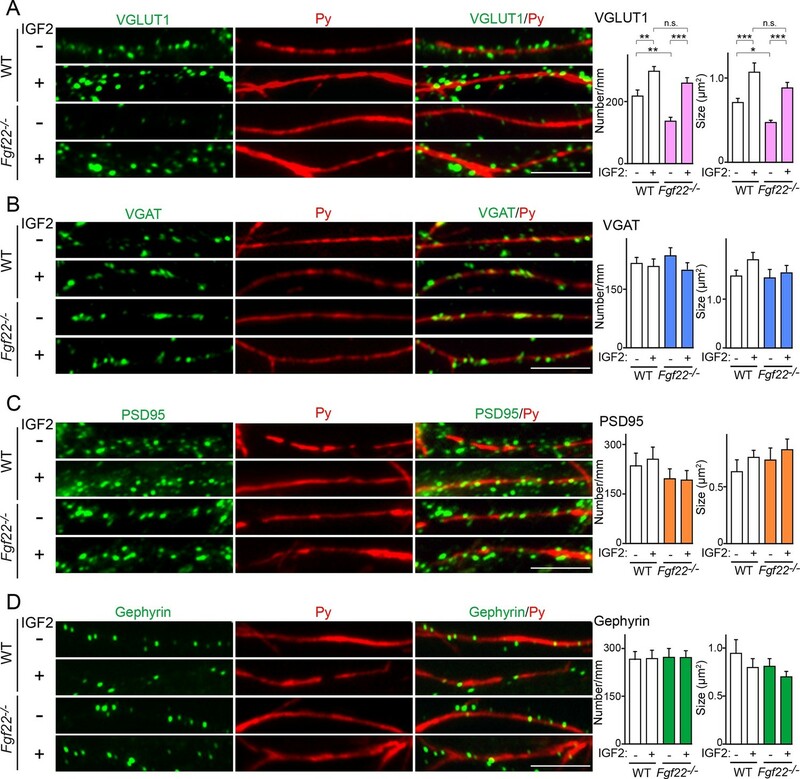 FGF22-dependent accumulation of synaptophysin-YFP in cultured wild-type DGCs required IGF2 only after 6DIV. Finally, excitatory synapses were reduced in IGF2-null calretinin-positive DGCs in vivo. From these data, authors conclude that target-derived FGF2 induces expression of IGF2, which is critical for the activity-dependent stabilization of DGC presynaptic terminals on CA3 neurons. It has not been clear whether and how target-derived molecules control gene transcription and stabilization of presynaptic terminals in the mammalian CNS. This study that sheds light on the novel role of FGF22-induced IGF2 in activity-dependent stabilization of presynaptic terminals in the hippocampus. However, several key issues need to be addressed to support the authors' claim. 1) Most of the data presented in this manuscript are of high quality and convincing, except Figure 3. Immunoreactive signals from IGF2 antibody are too faint and weak. Because the authors have potent IGF2 knockdown vector (Figure 8) and IGF2 knockout mice (Figure 9), the authors could validate the IGF2 antibody using these reagents. 2) The decrease in the frequency of mEPSCs in IGF2 knockout mice (Figure 9D and 9E) could be explained by a decrease in the release sites (inputs) and/or a decrease in the probability of neurotransmitter release. The authors could analyze the paired-pulse ratio to help interpret the data. 3) It is not completely clear at which stage of synapse development IGF2 works. As the same authors classified previously (Toth et al., Nat Neurosci 2013), three different stages of synapse development can be defined for DGC-CA3 synapses: P0-P14, initial synapse differentiation; P15-P29, synapse maturation; P30-P44, synapse maintenance. In most experiments, authors examined the effect of IGF2 at 10DIV (Figures 4–6) or 13DIV (Figure 7). Indeed, IGF2 is highly expressed in calretinin-positive DGCs, which mostly correspond to neurons born 3-17.5 days ago (Figure 1). Thus, IGF2 appears to be a molecule that regulates initial synapse "differentiation" after FGF22. The authors claim that IGF2 is dispensable for initial presynaptic differentiation, but critical for presynaptic stabilization based on Figure 8. However, in this experiment, FGF22 was applied to hippocampal neurons transfected with shRNA against IGF2 at 1DIV and examined at 6DIV or 12DIV. FGF22-induced synaptophysin accumulation was observed in neurons fixed at 6DIV, but not those at 12DIV. However, prolonged knockdown of IGF2 could have non-specific effects on neurons, such as reduction of synaptic vesicles and reduced expression of FGF receptors. To examine the role of IGF2 at later synapse developmental stages, the authors need to knockdown IGF2 at later time points. 4) It is interesting that FGF22-induced IGF2 expression only in calretinin-positive young DGCs (Figure 3), but not in other DGCs, which also respond to FGF22. However, IGF2 immunoreactivity remained unaffected in calbindin-positive DGCs in FGF22-null mice (Figure 1), indicating that IGF2 can be expressed in an FGF-independent manner. Many questions remain unanswered here. What determines the specific responsiveness of calretinin-positive DGCs to FGF22? How is IGF2 expressed in calbindin-positive DGCs in FGF22-null mice? What roles does IGF2 play in calbindin-positive DGCs? Why do DGCs express IGF2 by two different pathways (i.e., FGF22-dependent and independent) at different developmental stages? The authors need to provide some explanations. In most of the vitro experiments, the authors examined the roles of IGF2 on presynaptic differentiation in prox1-positive DGCs, which includes many calretinin-negative DGCs. Considering that FGF22-induced IGF2 expression was specifically observed in calretinin-positive DGCs, the authors need to focus on these cells, or at least show what percentage of their cultured neurons corresponds to calretinin-positive DGCs. 5) The model shown in Figure 9F is attractive, but is not completely supported by their data. First, it is unclear where and how IGF2 is located on presynaptic sites. Is overexpressed IGF2-EGFP localized on the surface of presynaptic terminals (Figure 4)? If so, depending on where and how IGF2 is released, IGF2 should not be considered as a local, but a global, presynaptic organizer. Second, it is unclear where and how neuronal activity is required for the effect of IGF2 (Figure 6). If IGF2 is secreted by neuronal activity as the authors suggest in the Discussion, why didn’t tetrodotoxin (TTX) treatment increase intracellular IGF2 levels? IGF2 may be transported to presynaptic terminals by neuronal activity, but why didn’t TTX treatment affect transport of synaptic vesicles (Figure 6E)? Neuronal activity may affect the exocytosis/endocytosis ratio or stabilization of IGF2 in axons. It is also possible that TTX treatment for 7 days from 1DIV may change expression of various genes that affect axon branching and expression of IGF2 receptors. Changes in postsynaptic neuronal activity may also contribute to presynaptic accumulation of synaptophsyin-YFP by some other mechanisms. These issues require further clarification and discussion. 6) The role of endogenous IGF2 at DGC-CA3 synapses in vivo is not completely clear from the data shown in Figure 9. Because the authors recorded from CA3 neurons, mEPSCs originating from synapses at the strata radiatum and lucidum are mixed. The authors need to show that mossy fiber-evoked EPSC(P)s are specifically affected in IGF2-null mice. In addition, changes in presynaptic differentiation should be assessed by paired-pulse stimulation of specific input fibers. Electron microscopic analyses of pre- and postsynaptic structures of DGC-CA3 synapses in IGF2-null mice would also strengthen the authors' argument. 1) Most of the data presented in this manuscript are of high quality and convincing, except Figure 3. Immunoreactive signals from IGF2 antibody are too faint and weak. Because the authors have potent IGF2 knockdown vector (Figure 8) and IGF2 knockout mice (Figure 9), the authors could validate the IGF2 antibody using these reagents. We appreciate the comment. As suggested, we have validated the IGF2 antibody using IGF2 knockout (KO) mice. As shown in Figure 1—figure supplement 2, the antibody did not stain IGF2KO sections both in the dentate granule cells (DGCs) and choroid plexus, where IGF2 is known to be highly expressed (Lun et al., 2015; Stylianopoulou et al., 1988; Ayer-le Lievre et al., 1991). Please note that in Figure 3, IGF2 signals are high in cultured DGCs treated with FGF22, but not in DGCs without FGF22 (Figure 3A, C, G, H) or in CA3 neurons (Figure 3D). 2) The decrease in the frequency of mEPSCs in IGF2 knockout mice (Figure 9D and 9E) could be explained by a decrease in the release sites (inputs) and/or a decrease in the probability of neurotransmitter release. The authors could analyze the paired-pulse ratio to help interpret the data. We appreciate the comment. To further characterize the synaptic defects in IGF2KO mice, we have performed additional electrophysiological recordings and electron microscopic analyses. Electrophysiological analysis for DGC-CA3 connections revealed that i) the maximum fEPSP slope is significantly lower in IGF2KO than WT controls and ii) the paired pulse ratio is significantly lower in IGF2KO than WT controls. Electron microscopic analysis of synapses in the CA3 stratum lucidum layer revealed that i) there are similar numbers of synapses as assessed by the number of postsynaptic densities between WT and IGF2KO mice and ii) there are fewer synaptic vesicles, less clustering of synaptic vesicles, and fewer docked vesicles in the presynaptic terminals in IGF2KO relative to WT mice. 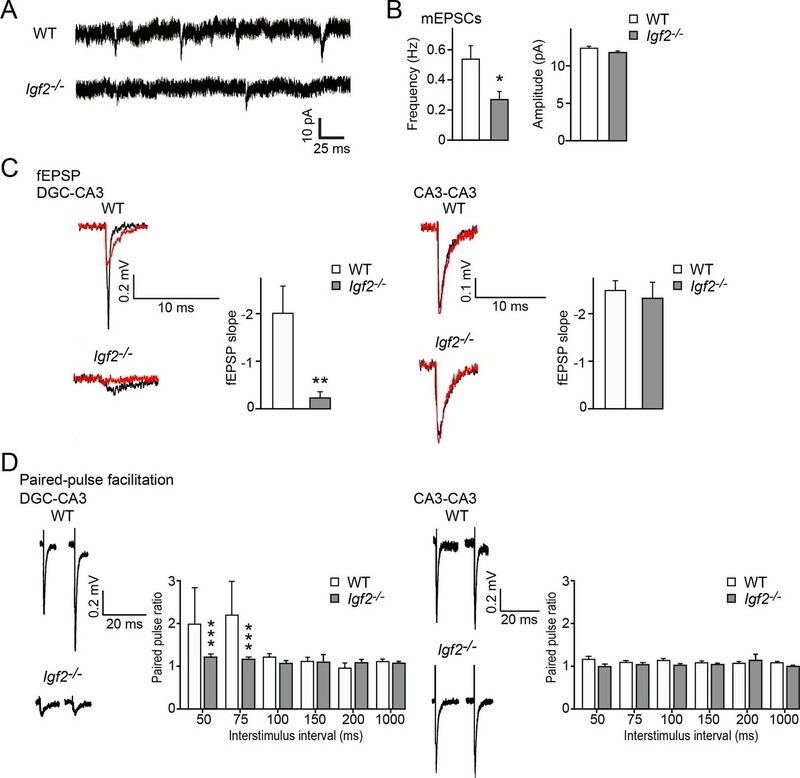 These results suggest that excitatory synaptic transmission at DGC-CA3 synapses is impaired in IGF2KO mice due to the loss of synaptic vesicles from the presynaptic terminals. These results are included in Figure 10 and Figure 11, and described in the manuscript. 3) It is not completely clear at which stage of synapse development IGF2 works. As the same authors classified previously (Toth et al., Nat Neurosci 2013), three different stages of synapse development can be defined for DGC-CA3 synapses: P0-P14, initial synapse differentiation; P15-P29, synapse maturation; P30-P44, synapse maintenance. In most experiments, authors examined the effect of IGF2 at 10DIV (Figures 4–6) or 13DIV (Figure 7). Indeed, IGF2 is highly expressed in calretinin-positive DGCs, which mostly correspond to neurons born 3-17.5 days ago (Figure 1). Thus, IGF2 appears to be a molecule that regulates initial synapse "differentiation" after FGF22. The authors claim that IGF2 is dispensable for initial presynaptic differentiation, but critical for presynaptic stabilization based on Figure 8. However, in this experiment, FGF22 was applied to hippocampal neurons transfected with shRNA against IGF2 at 1DIV and examined at 6DIV or 12DIV. FGF22-induced synaptophysin accumulation was observed in neurons fixed at 6DIV, but not those at 12DIV. However, prolonged knockdown of IGF2 could have non-specific effects on neurons, such as reduction of synaptic vesicles and reduced expression of FGF receptors. To examine the role of IGF2 at later synapse developmental stages, the authors need to knockdown IGF2 at later time points. We appreciate the comment. In our previous papers, we have defined the stages of synapse development based on its dependence on neural activity: in the hippocampus, synapse development from P0 to ~P14 is not apparently influenced by neural activity ("initial synapse differentiation"), but that from ~P14 to ~P28 is regulated by activity, where we found that activity-dependent synapse maturation (e.g., mediated by SIRP; Toth et al., 2013) and activity-dependent synapse elimination (Yasuda et al., 2011) take place. Because the effects of IGF2 are dependent on neural activity, we proposed that IGF2 is critical for "synapse maturation/stabilization" in the manuscript. As suggested, we have further examined the role of IGF2 at later stages of synapse development both in vitro and in vivo. In vitro, we knocked down IGF2 at a later synapse developmental stage, from DIV6, and examined the effects at DIV12. We found that IGF2 knockdown from DIV6 decreased the number and size of presynaptic terminals (as assessed by synaptophysin-YFP) and blocked the synaptogenic effects of FGF22. Since IGF2 knockdown from DIV1-DIV6 did not affect presynaptic terminals or synaptogenic effects of FGF22 (Figure 8A and B), our result suggests that IGF2 is indeed critical for a later stage of synapse development (after DIV6). This new result is included in Figure 8E–F. In vivo, we analyzed the time course of presynaptic development in IGF2KO mice from P8 to P29. We found that in the SL layer of CA3, IGF2KO mice show no presynaptic defects at P8, but start to show mild defects at P14 (the number of VGLUT1 puncta was normal, but their size was decreased), and exhibit significant defects at P21 and P29 (both the number and size of VGLUT1 puncta were significantly decreased). We did not detect any changes in the SR layer of CA3. Thus, IGF2 appears to be mainly important for DGC-CA3 synapse development after P14. These results are included in Figure 9. These results suggest that IGF2 is not critical for initial synapse development, but is important for the later stages of synapse development (after DIV6 or P14). As IGF2 effects are activity dependent (Figure 6), we propose that IGF2 is mainly important for the stages of synapse maturation and stabilization. These results are also discussed in the text (subsection “Temporal and Spatial Specificity of IGF2 Effects”, first paragraph). 4) It is interesting that FGF22-induced IGF2 expression only in calretinin-positive young DGCs (Figure 3), but not in other DGCs, which also respond to FGF22. However, IGF2 immunoreactivity remained unaffected in calbindin-positive DGCs in FGF22-null mice (Figure 1), indicating that IGF2 can be expressed in an FGF-independent manner. Many questions remain unanswered here. What determines the specific responsiveness of calretinin-positive DGCs to FGF22? How is IGF2 expressed in calbindin-positive DGCs in FGF22-null mice? What roles does IGF2 play in calbindin-positive DGCs? Why do DGCs express IGF2 by two different pathways (i.e., FGF22-dependent and independent) at different developmental stages? The authors need to provide some explanations. We agree with the reviewer that because IGF2 is still expressed in calbindin-positive DGCs in Fgf22-/-mice, IGF2 can be expressed in an FGF22-independent manner as well. Indeed, IκB, which is not utilized by FGF22 signaling, has been shown to induce expression of IGF2 for spine maturation in mature hippocampal neurons (Schmeisser MJ, et al., 2012). The expression of the mouse Igf2 gene is regulated by three alternative promoters (Sasaki et al., 1992). Thus, different signals seem to be used to regulate distinct phases of neuronal development. Specific responsiveness of calretinin-positive DGCs to FGF22 appears to be linked to the developmental stage. Calretinin-positive DGCs elongate axons to CA3 and contact CA3 pyramidal neurons to form synapses (Ming and Song, 2005; Li et al., 2009; Aguilar-Arredondo A et al., 2015; Yasuda et al., 2011), and that is when DGCs respond to FGF22. Thus, around that stage, DGCs may become more responsive to FGF22. We have included these points in the Discussion (subsection “Temporal and Spatial Specificity of IGF2 Effects”, first paragraph). In most of the vitro experiments, the authors examined the roles of IGF2 on presynaptic differentiation in prox1-positive DGCs, which includes many calretinin-negative DGCs. Considering that FGF22-induced IGF2 expression was specifically observed in calretinin-positive DGCs, the authors need to focus on these cells, or at least show what percentage of their cultured neurons corresponds to calretinin-positive DGCs. We appreciate the comment. As suggested, we examined the percentage of calretinin-positive DGCs in culture by co-staining for calretinin and prox1. We found that a majority of DGCs (around two thirds) were calretinin positive in our culture. Thus, our results with DGCs mostly reflect results from calretinin-positive DGCs. We have added these data in Figure 3—figure supplement 1 and described the results in the text. 5) The model shown in Figure 9F is attractive, but is not completely supported by their data. First, it is unclear where and how IGF2 is located on presynaptic sites. Is overexpressed IGF2-EGFP localized on the surface of presynaptic terminals (Figure 4)? If so, depending on where and how IGF2 is released, IGF2 should not be considered as a local, but a global, presynaptic organizer. We examined whether IGF2-EGFP is localized on the surface of neurons by staining transfected neurons without a detergent (with anti-GFP followed by Alexa Fluor 647). We found that ~40% of IGF2-EGFP is localized on the surface of neurons. 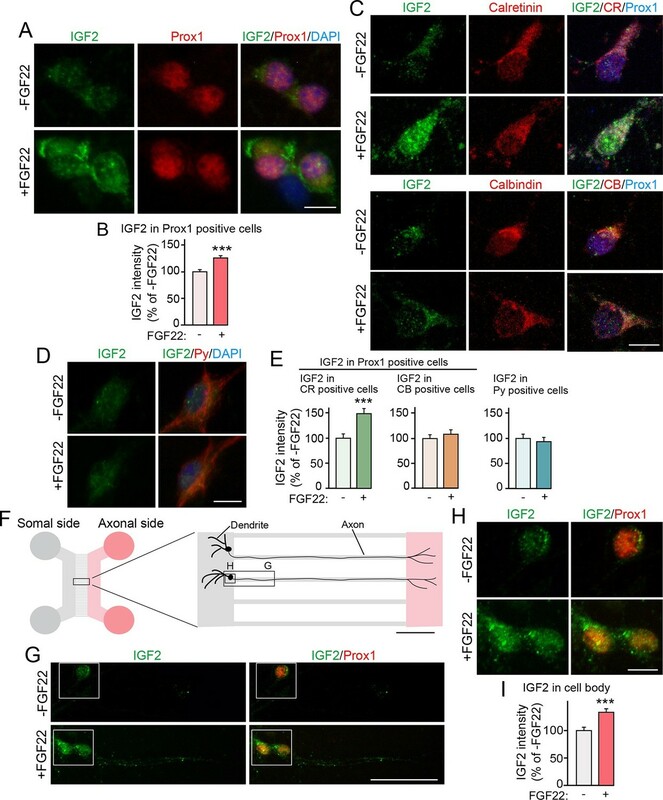 Furthermore, surface IGF2-EGFP is always localized at presynaptic terminals, as it shows perfect colocalization with synaptophysin-mCherry. A majority of intracellular IGF2 is also localized at presynaptic terminals (~75%). In addition, we found that the major receptor for IGF2, IGF2R, is also localized at presynaptic terminals (a minor receptor for IGF2, IGFR1, is also localized at synapses; Gazit et al., 2016). These results are consistent with the notion that IGF2 is secreted from the presynaptic terminal and binds to IGF2R, which is also localized at the presynaptic terminal, so that IGF2 acts locally in an autocrine manner for its effects. These data are included in Figure 4 and Figure 4—figure supplement 1. We do agree that it is possible that secreted IGF2 may also act as a global presynaptic organizer if IGF2 is released from the presynaptic terminal. We have discussed this possibility in the text (subsection “A Novel Feedback Pathway through Transcriptional Regulation for Presynaptic Stabilization in the Mammalian Brain”, second paragraph). Second, it is unclear where and how neuronal activity is required for the effect of IGF2 (Figure 6). If IGF2 is secreted by neuronal activity as the authors suggest in the Discussion, why didn’t tetrodotoxin (TTX) treatment increase intracellular IGF2 level?. IGF2 may be transported to presynaptic terminals by neuronal activity, but why didn’t TTX treatment affect transport of synaptic vesicles (Figure 6E)? Neuronal activity may affect the exocytosis/endocytosis ratio or stabilization of IGF2 in axons. It is also possible that TTX treatment for 7 days from 1DIV may change expression of various genes that affect axon branching and expression of IGF2 receptors. Changes in postsynaptic neuronal activity may also contribute to presynaptic accumulation of synaptophsyin-YFP by some other mechanisms. These issues require further clarification and discussion. We appreciate the comments. To further address the role of activity on IGF2 localization and function, we suppressed intrinsic neuronal excitability by overexpressing the inwardly rectifying potassium channel Kir2.1. We found that co-expression of Kir2.1 with IGF2 decreased synaptic localization of IGF2 as well as its synaptogenic function, similarly to the effects of TTX. These experiments suggest that intrinsic neuronal excitability of the presynaptic neurons is critical for IGF2 localization and thus, for its synaptogenic function. We think that since neural activity is important for IGF2 transportation, TTX/Kir2.1 did not increase the intracellular IGF2 levels. 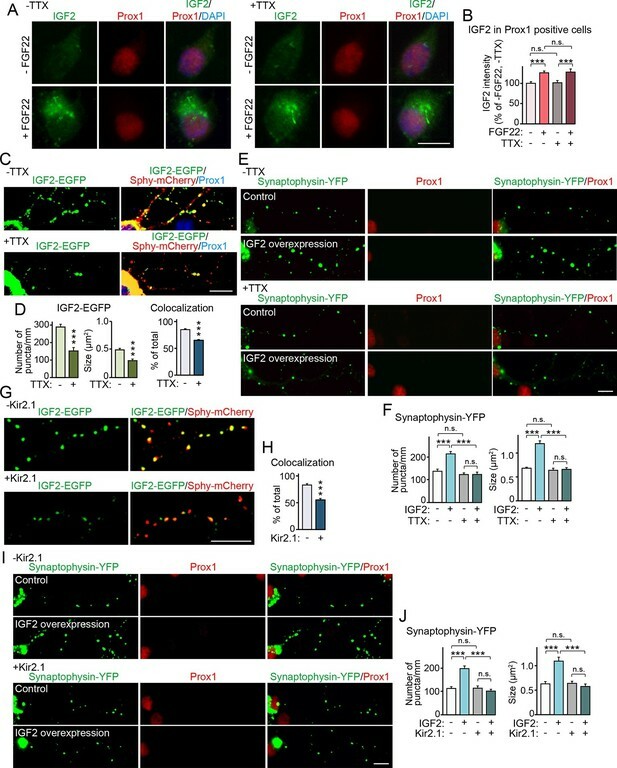 We also think that IGF2's effects are for the stabilization of synaptic vesicles but not for the initial recruitment of synaptic vesicles (which is carried out by FGF22), and thus, TTX/Kir2.1 did not affect synaptic vesicle transportation. We agree that neural activity may affect the secretion of IGF2, and we plan to utilize IGF2-pHluorin to test this idea in future studies. We also agree that various activity-dependent genes might influence IGF2/IGF2R localization, which is an interesting future study. Our Kir2.1 experiments, in which Kir2.1 was sparsely transfected so that we can ignore effects from postsynaptic neurons, suggest that changes in postsynaptic activity do not play critical roles in IGF2 localization and function. We have included the data with Kir2.1 in Figure 6I–J and discussed these points in the text (subsection “Activity-Dependent Regulation of Presynaptic Stabilization by IGF2”). We appreciate the comment. To further characterize the synaptic defects in IGF2KO mice, we have performed additional electrophysiological recordings and electron microscopic analyses. Electrophysiological analysis revealed that i) the maximum fEPSP slope for DGC-CA3 connections, but not for CA3-CA3 connections, is significantly lower in IGF2KO than WT controls and ii) the paired pulse ratio for DGC-CA3 connections, but not for CA3-CA3, is significantly lower in IGF2KO than WT controls. Electron microscopic analysis revealed that i) there are similar numbers of synapses in the stratum lucidum (SL: where DGC-CA3 synapses locate) and stratum radiatum (SR: where CA3-CA3 synapses locate) layers as assessed by the number of postsynaptic densities between WT and IGF2KO mice and ii) there are fewer synaptic vesicles, less clustering of synaptic vesicles, and fewer docked vesicles in the presynaptic terminals in the SL layer, and not the SR layer, of IGF2KO relative to WT mice. These results suggest that excitatory synaptic transmission at DGC-CA3, and not CA3-CA3, synapses is specifically impaired in IGF2KO mice due to the loss of synaptic vesicles from the presynaptic terminals in the SL, and not SR, layer. Thus, our results show that IGF2 is critical for the stabilization/maintenance of synaptic vesicles specifically at the DGC-CA3 synapses. These results are included in Figure 10 and Figure 11, and described in the manuscript. We thank Mei Zhang, Patricia Lee and Hillary Mullan for animal care; Aaron Reifler and Robert Thompson for help with microarray screen; Gorski Grzegorz for help with electron microscopy; Ania Dabrowski and Erin Piell for technical assistance; Masahiro Yasuda and Sivapratha Nagappan Chettiar for critical reading of the manuscript. This work was supported by NIH grants R01-NS070005 and R01-MH091429 (HU) and R00-NS072192 (ML) as well as by the Bipolar Disorder Fund for Neuroscience Research at Harvard University, supported by Kent and Liz Dauten (HU). Animal experimentation: All animal care and use in this study was in accordance with the institutional guidelines and approved by the Institutional Animal Care and Use Committees at Boston Children's Hospital (#13-11-2528) and University of Michigan (#PRO00003549). © 2016, Terauchi et al.